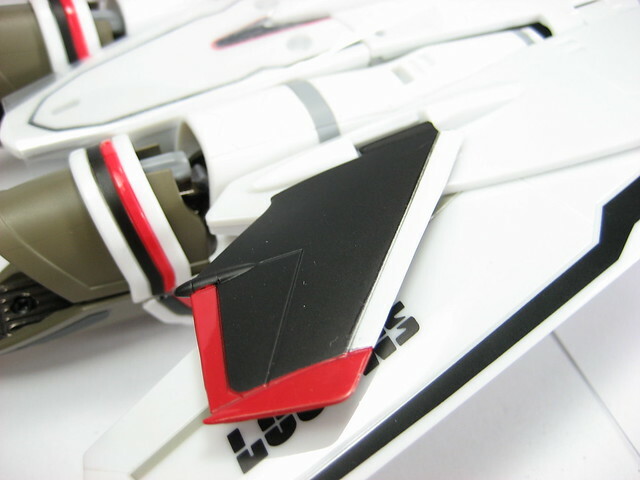 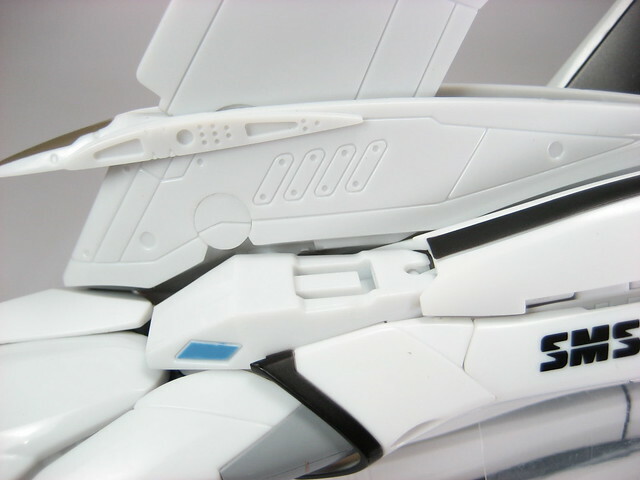 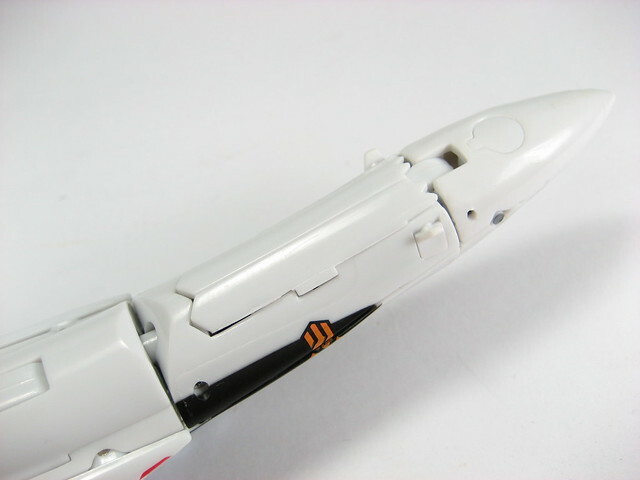 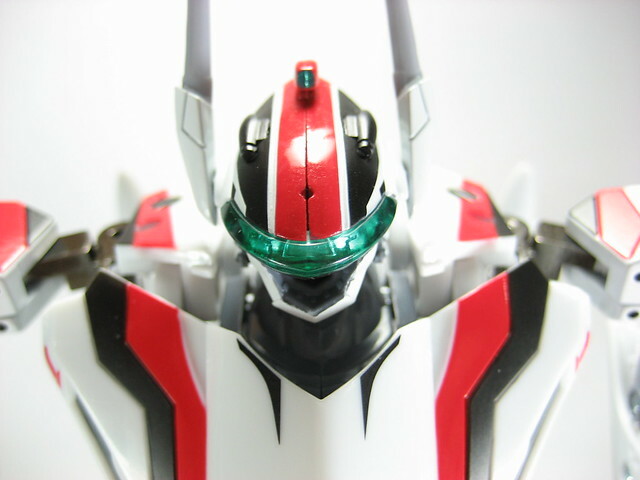 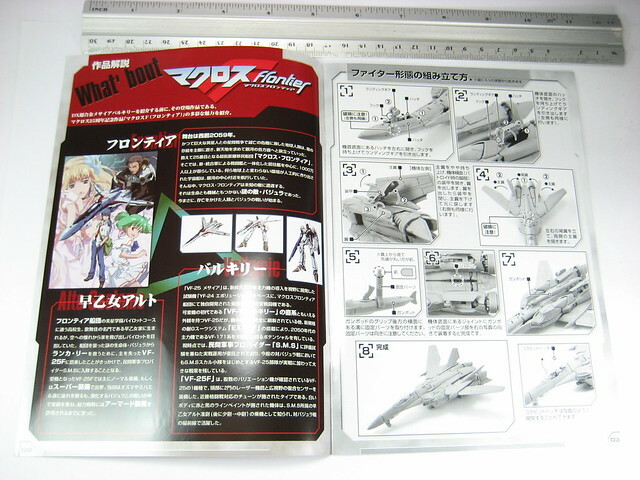 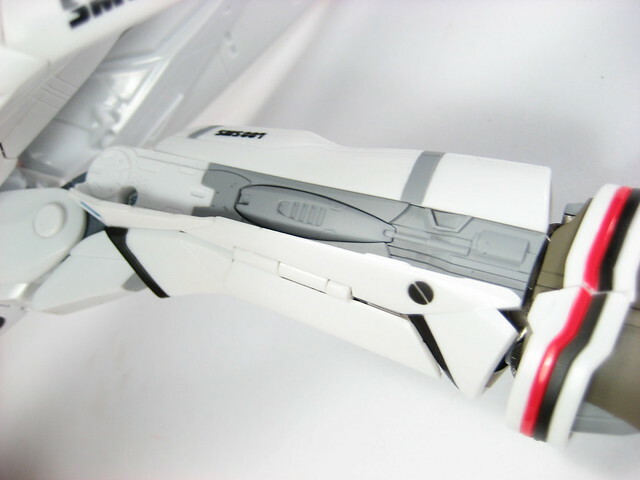 Update: Manual for the 1/60 DX VF-25F Messiah Valkyrie Alto Custom was translated to English, here. 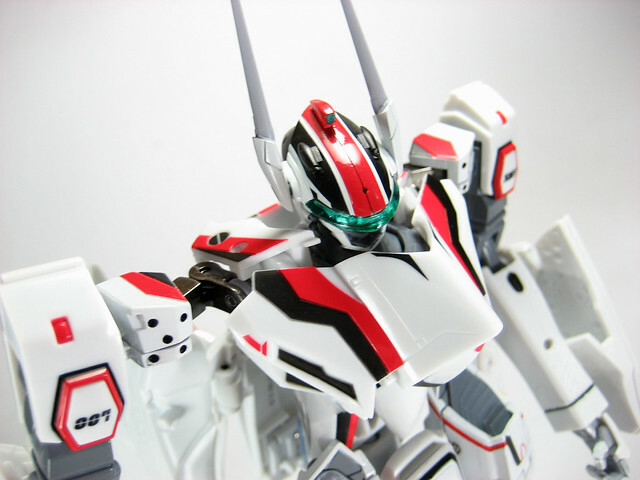 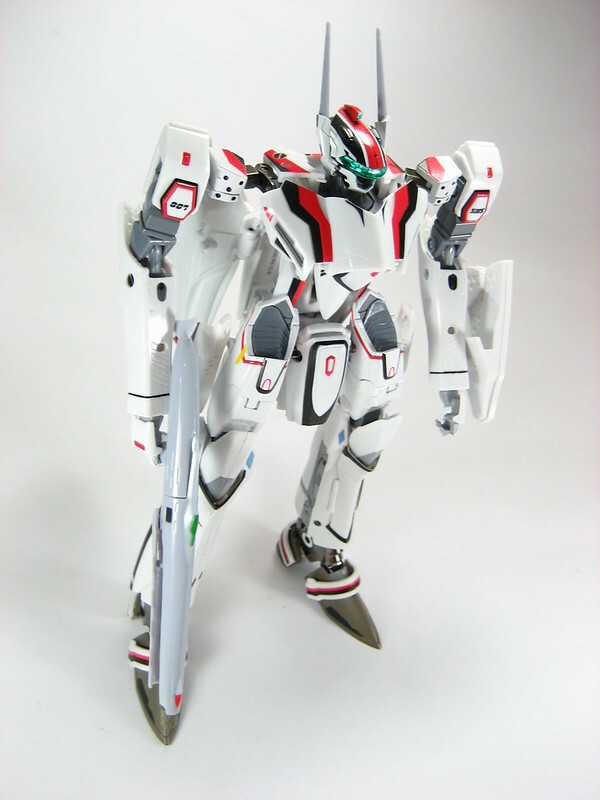 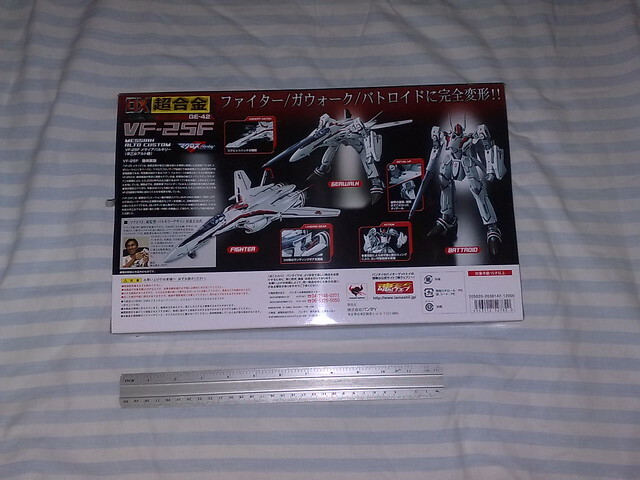 Got this from HobbyLink Japan, a 1/60 DX Chogokin VF-25F Messiah Valkyrie Alto Custom from the Macross Frontier anime. 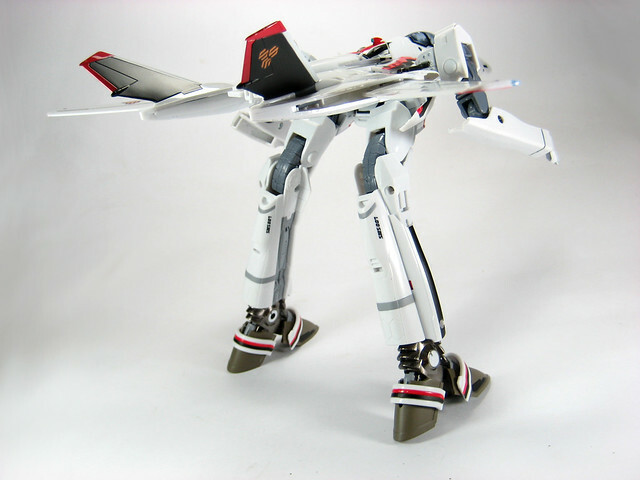 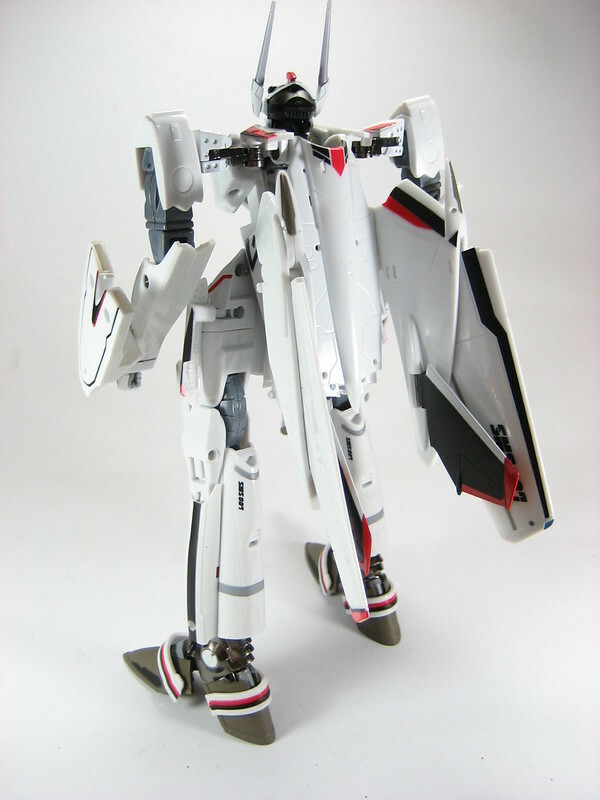 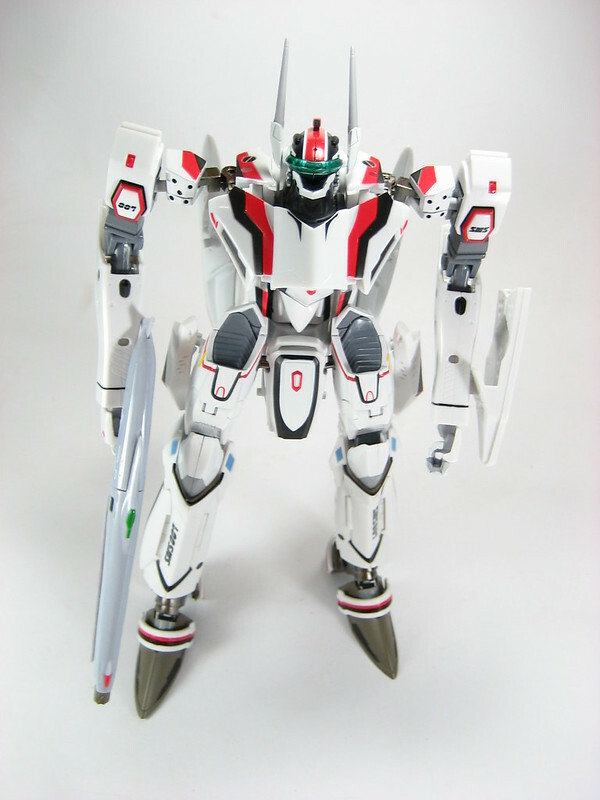 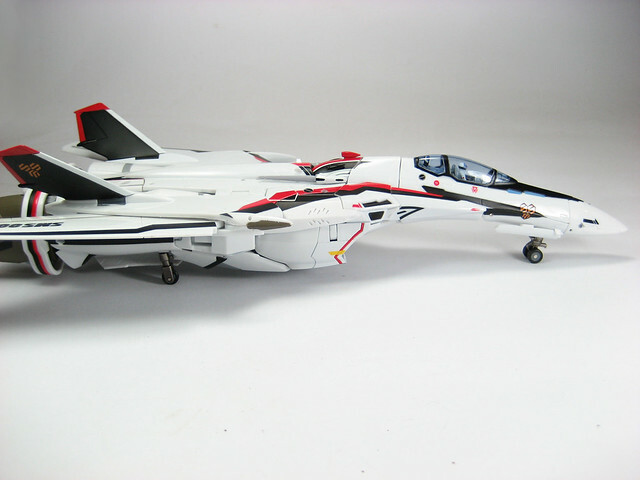 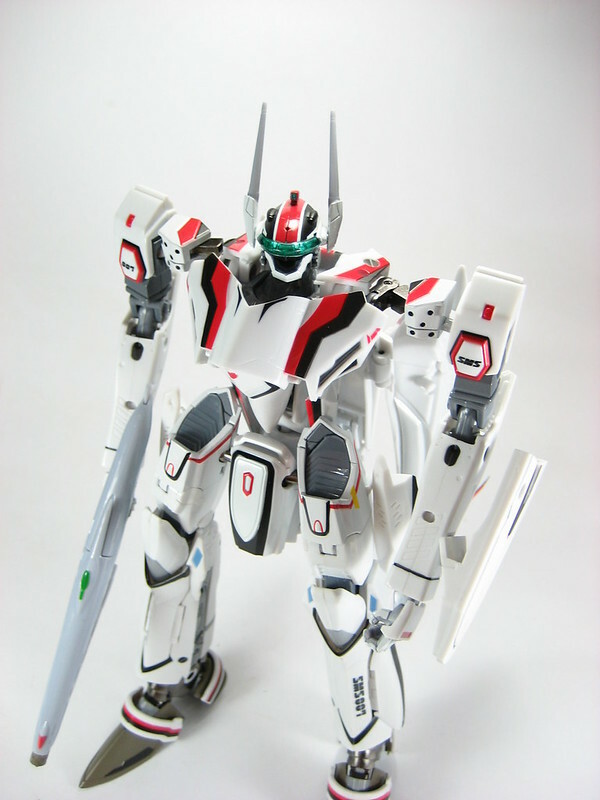 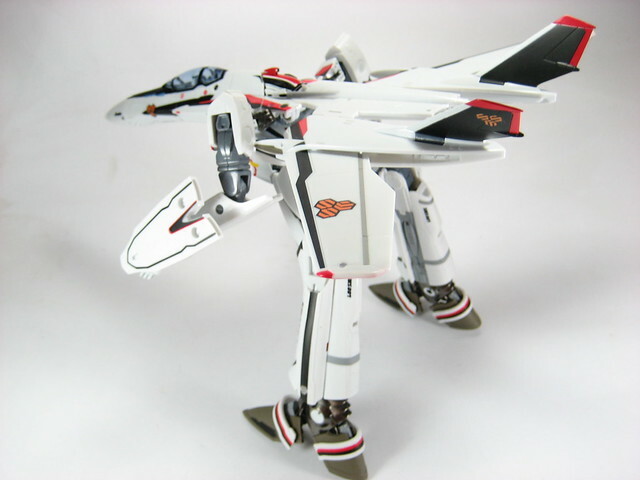 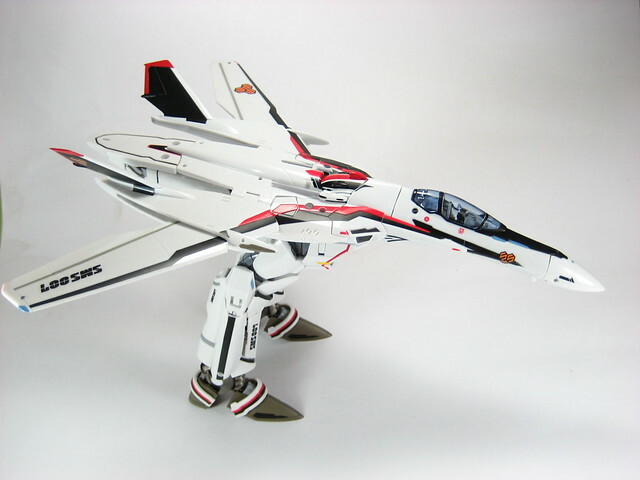 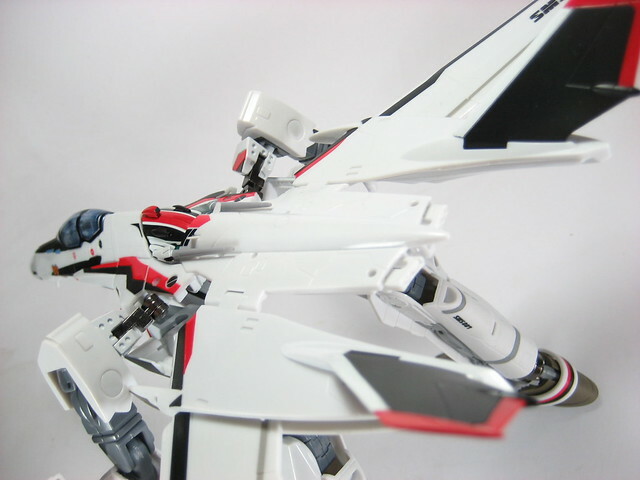 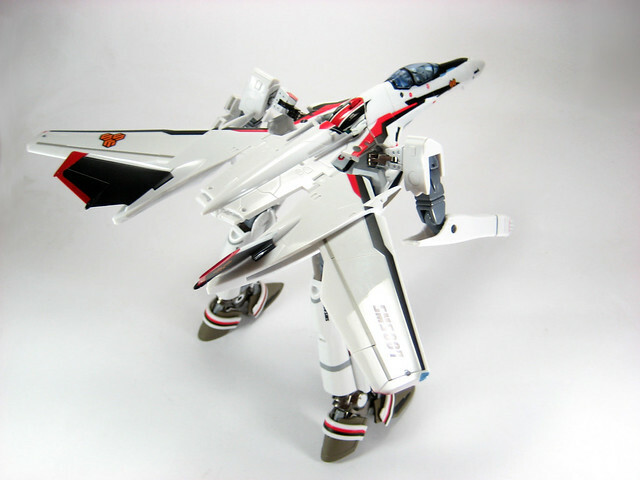 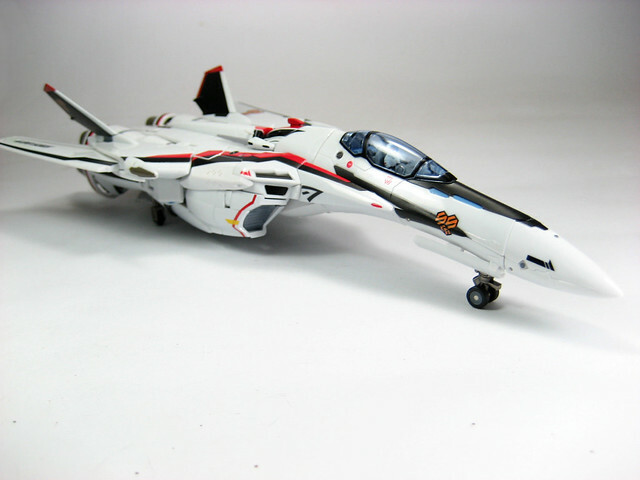 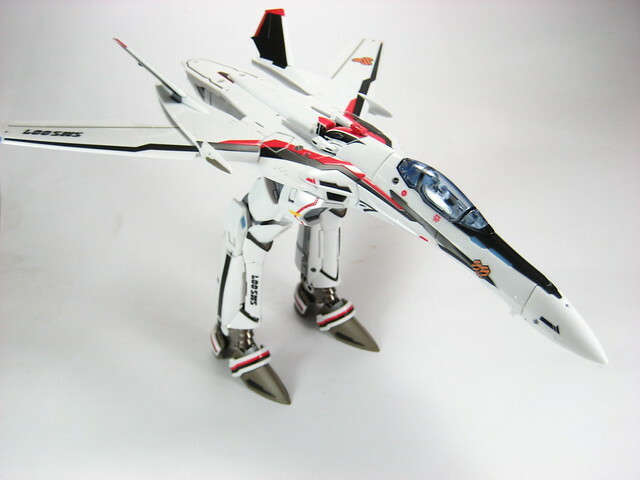 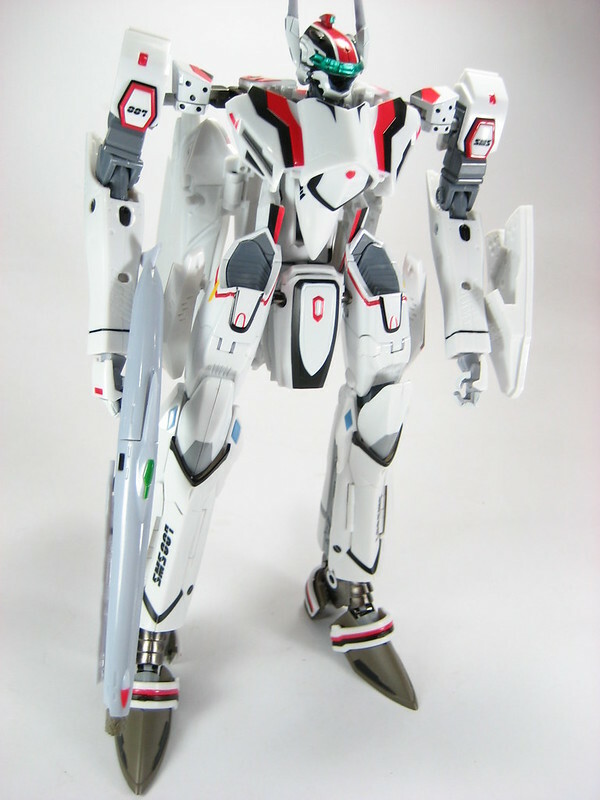 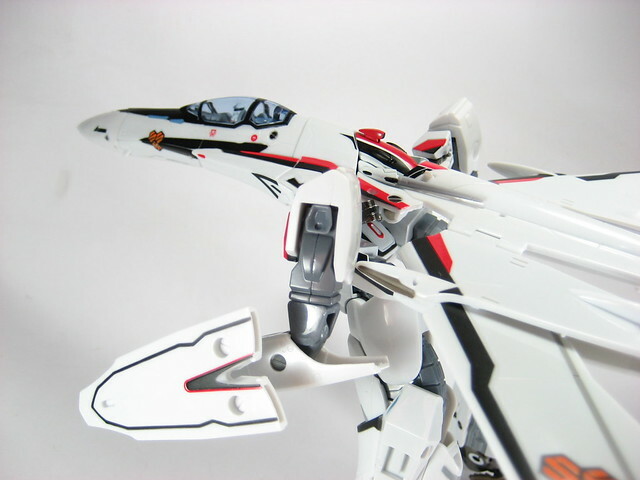 This 1/60 DX Chogokin version of the VF-25F Messiah was first released by Bandai in December of 2008 but still seems to be a popular toy with Macross fans. 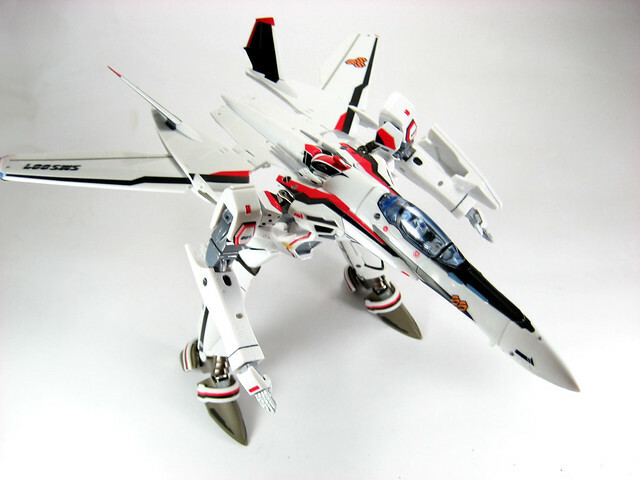 The first time I saw this I was pretty much impressed and now that I see it in the flesh my enthusiasm for the toy has not diminished. 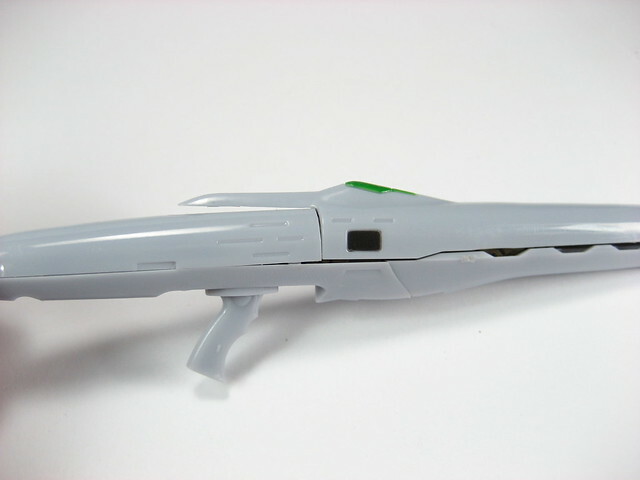 The major quality control issue that I found was some paint chipping on the head part which I observed even before I got it out of its plastic covering. 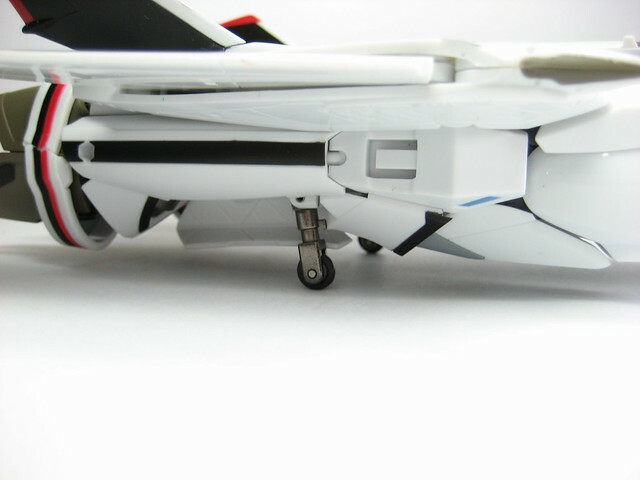 One obvious eyesore are the rear wheels that are too short and unrealistic looking. 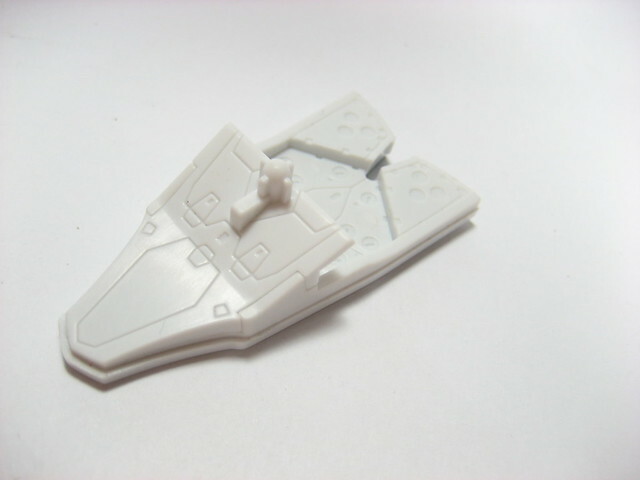 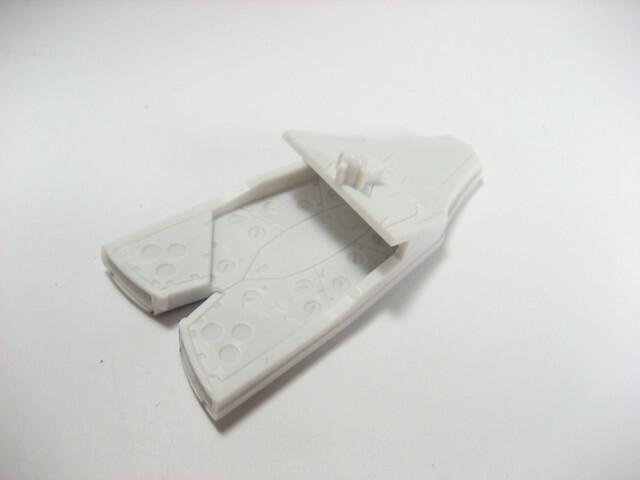 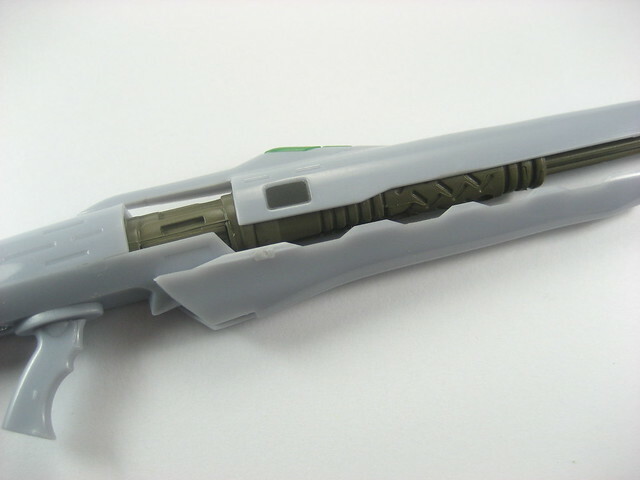 Then there's the gunpod, whose detail aren't as well defined as the rest of the kit because of the quality of plastic that they used. 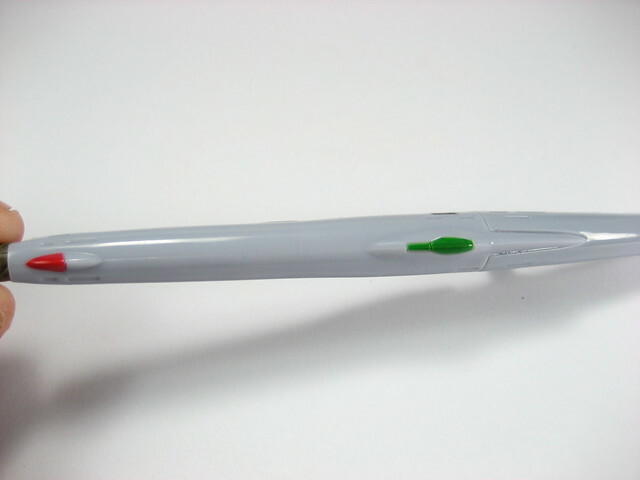 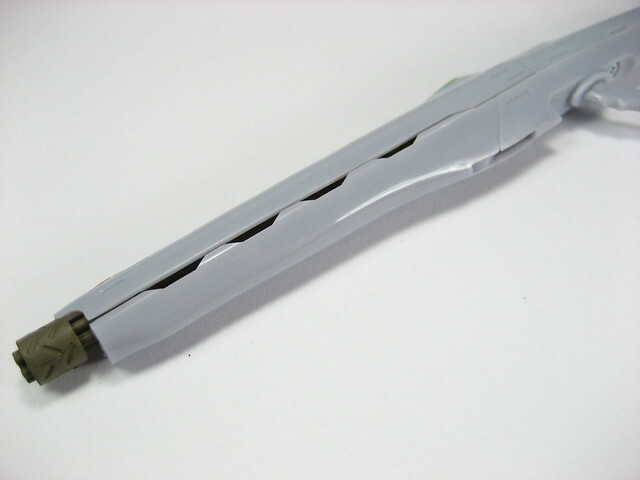 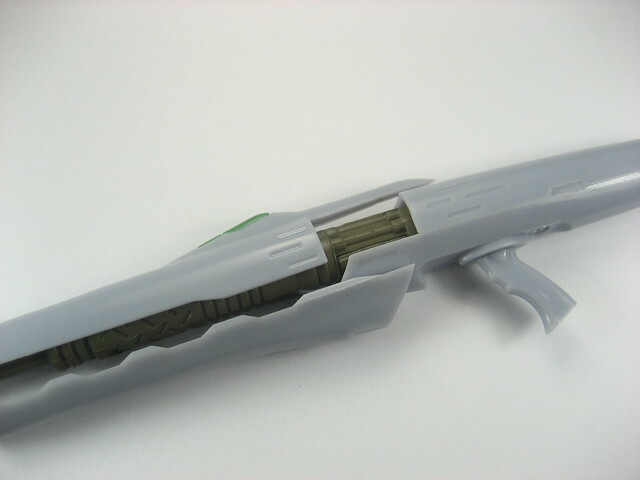 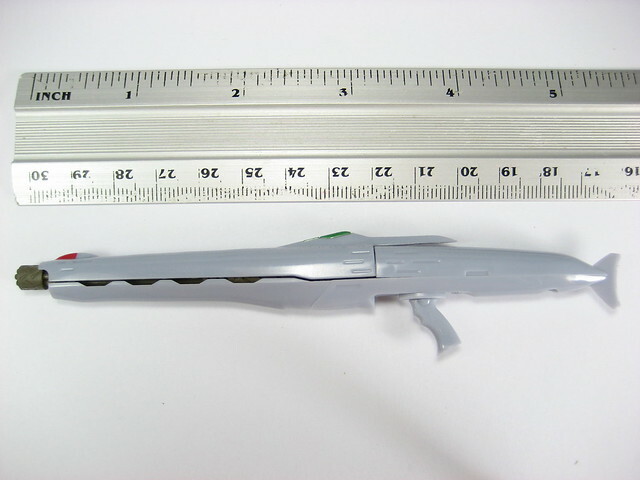 There's also the one head cannon that doesn't straighten out real well because of the rubbery material that it is made out of. 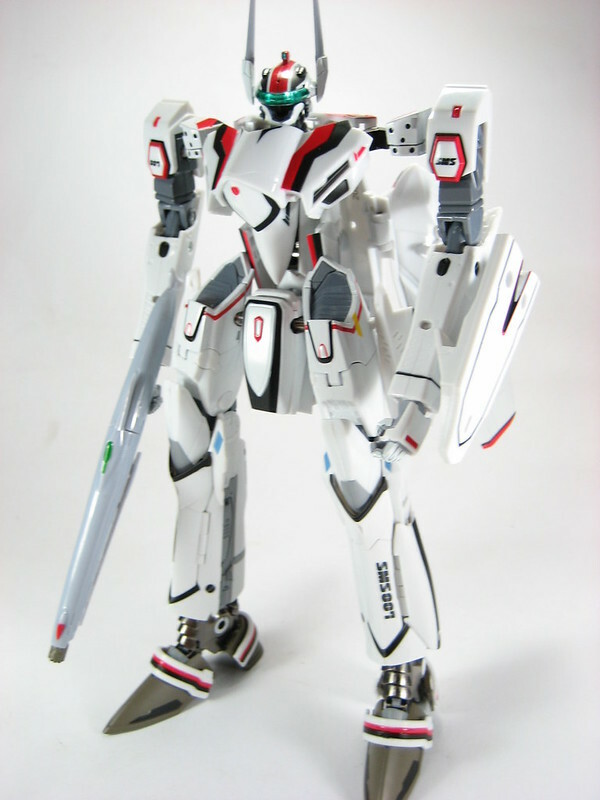 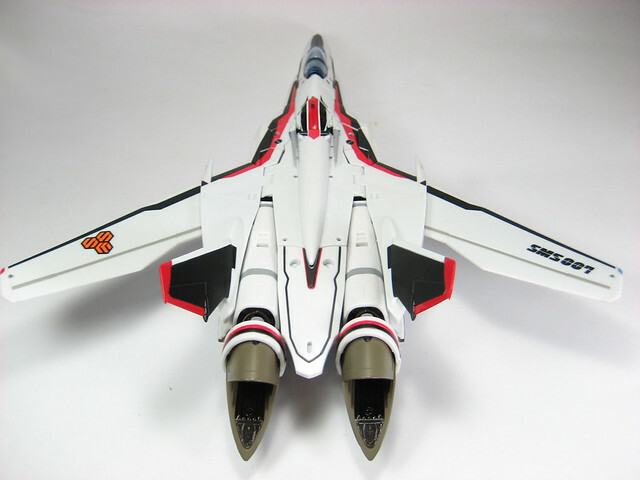 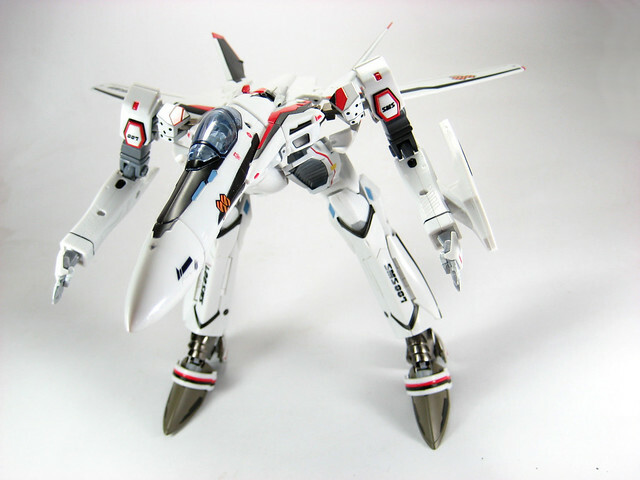 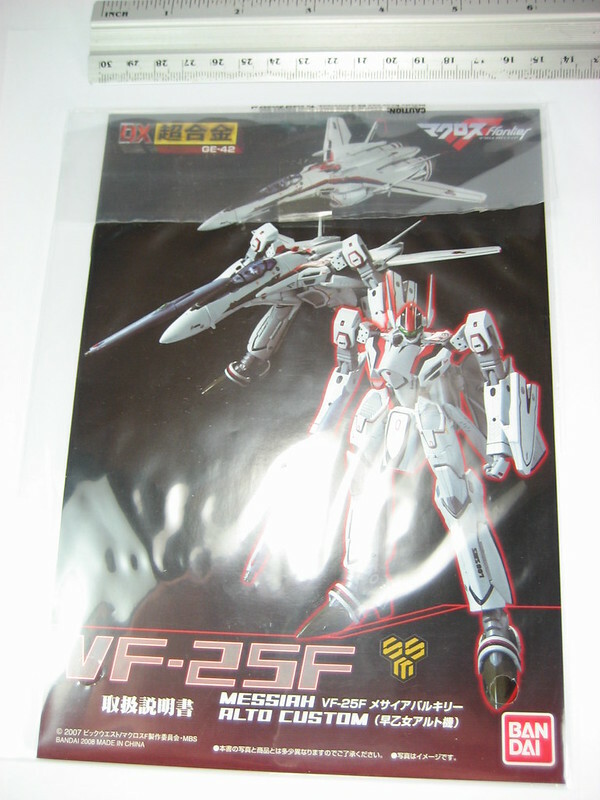 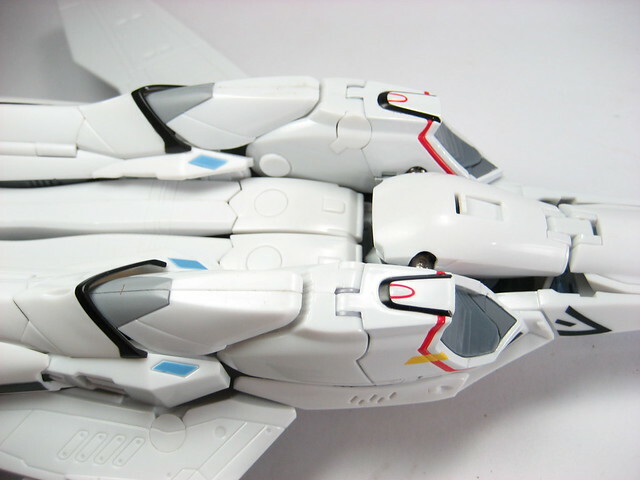 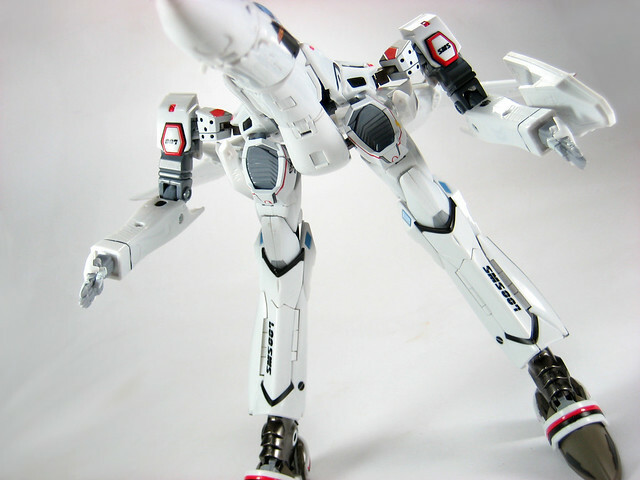 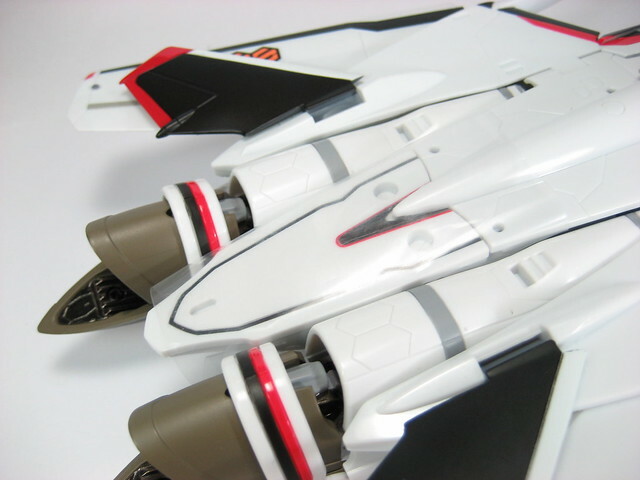 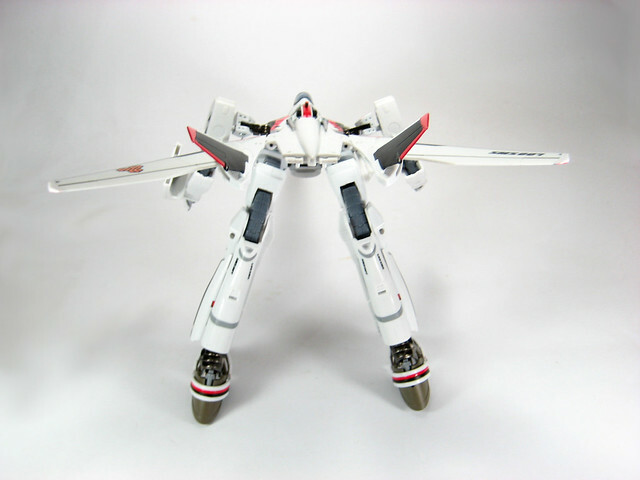 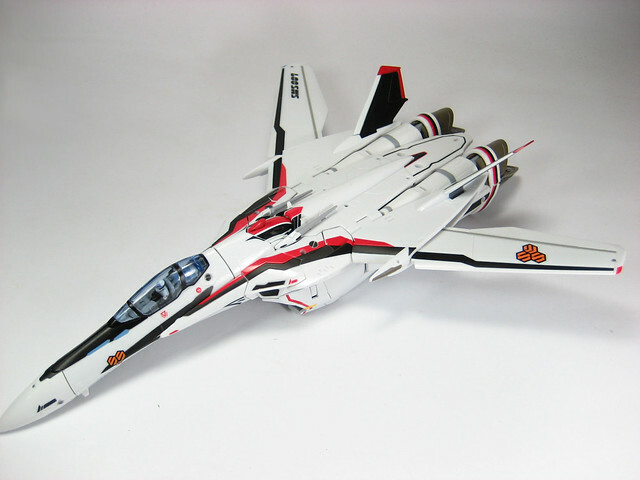 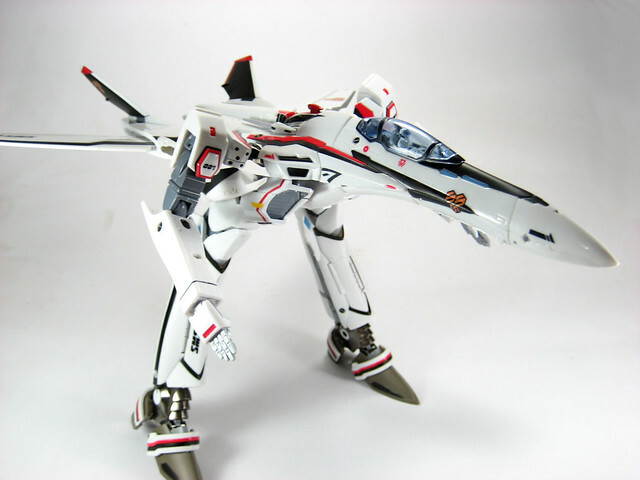 But being the huge Macross fan that I am, I am willing to overlook all this because overall I think that Bandai recreated the VF-25F real well from its actual design. 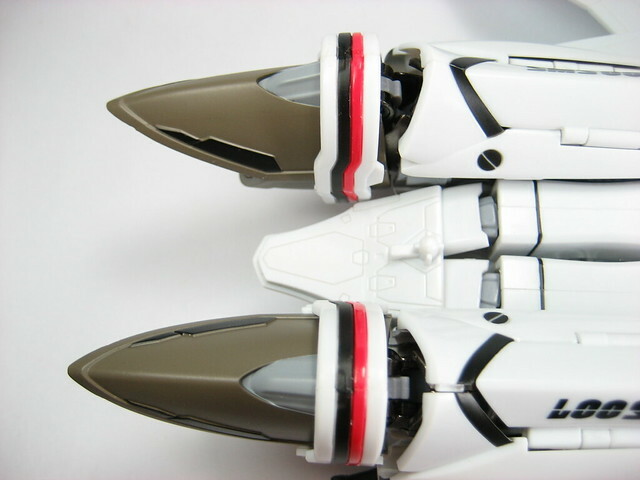 Comparing it with the Yamato Toys line of 1/60 Macross kits, I have to say that its really neck and neck with Yamato toys having only a slight advantage in terms of details. 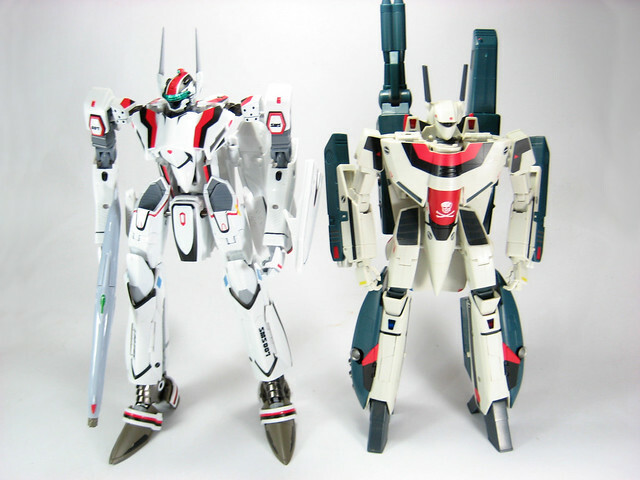 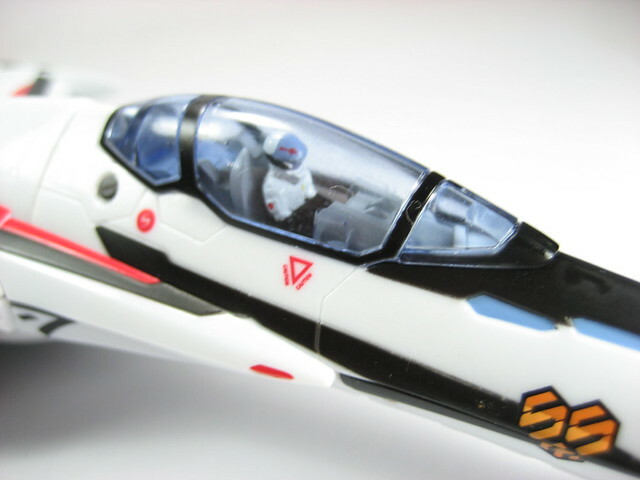 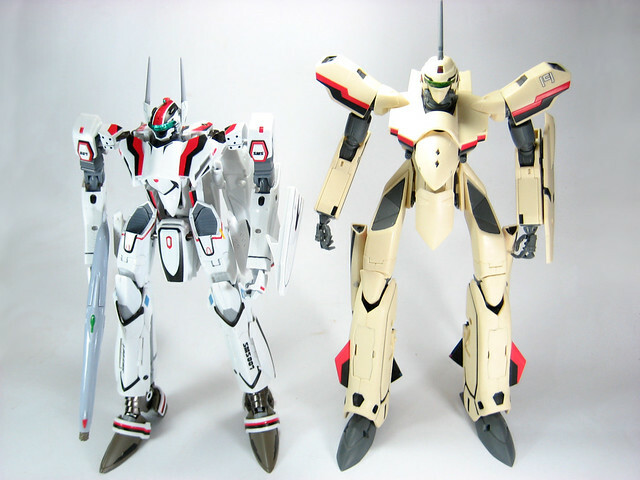 Its hard not to compare the two Macross lines (Bandai & Yamato) because they are in the same scale (1/60) but competition wise, I think there really is no competition as both make dissimilar products owing to the licenses they own. 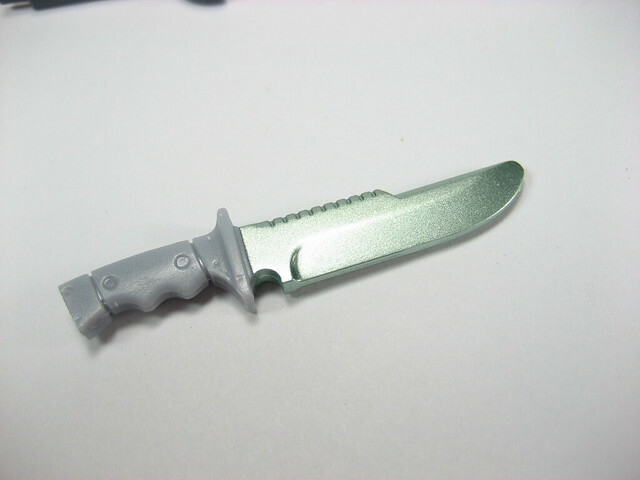 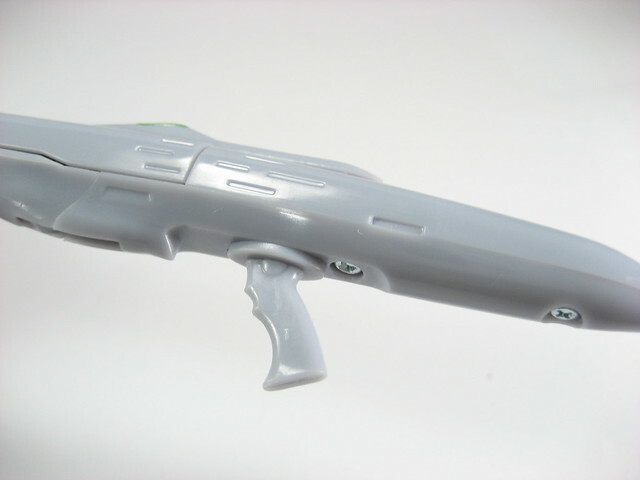 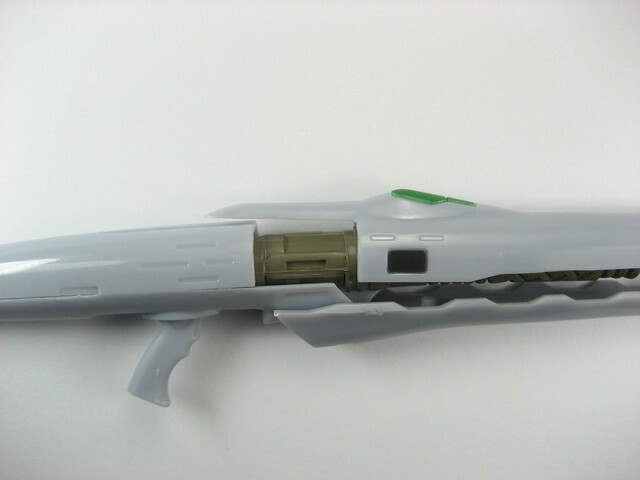 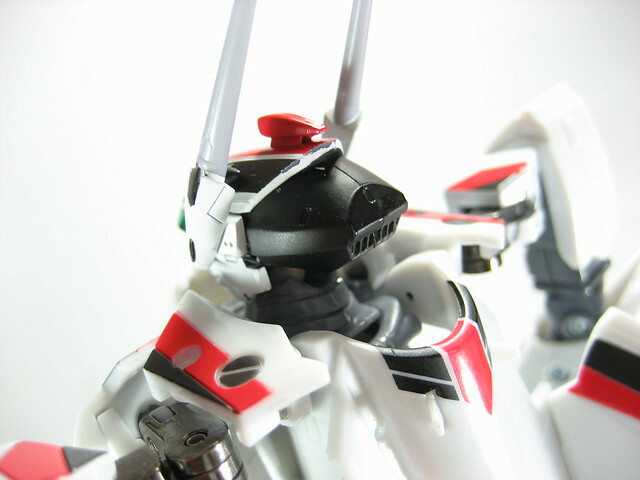 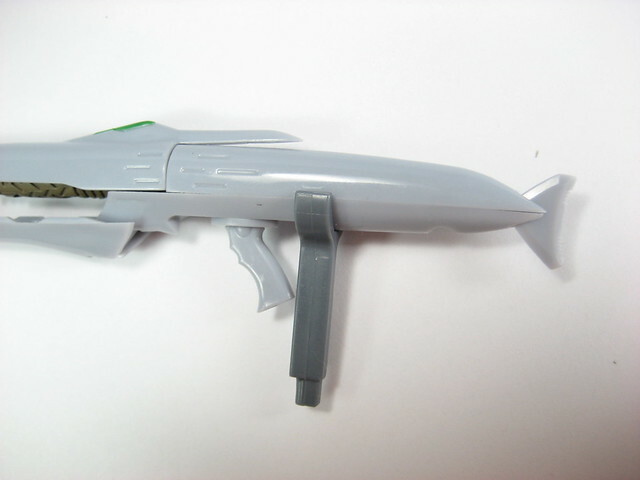 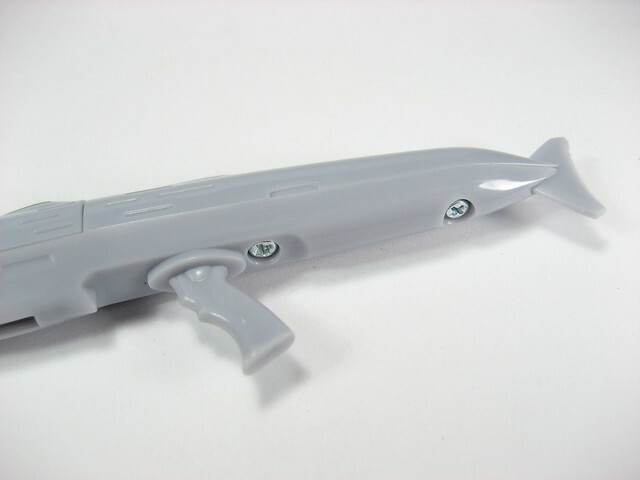 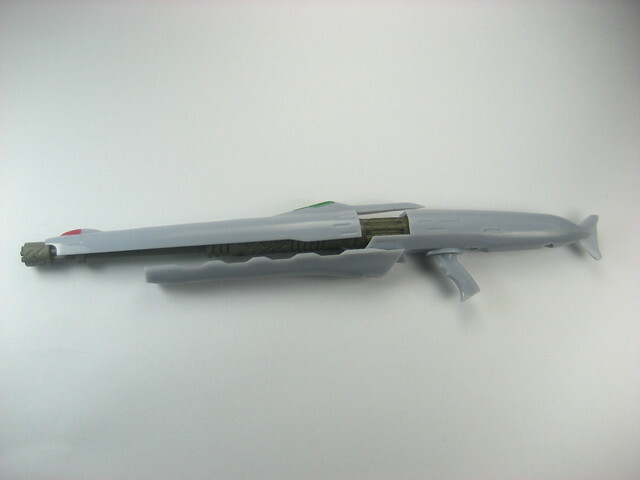 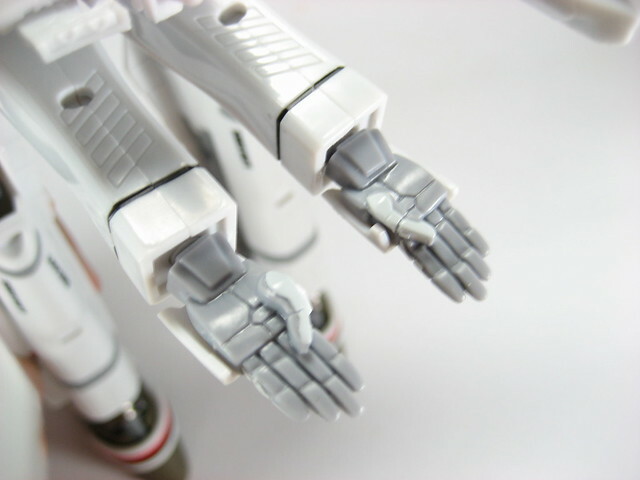 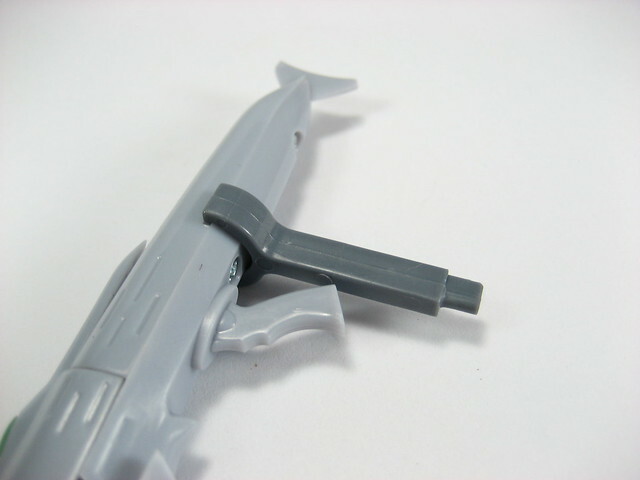 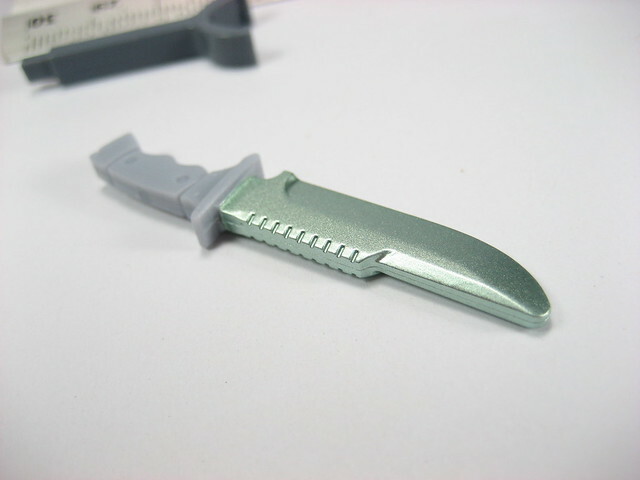 Accessories wise, this toy comes with a gunpod, gunpod joint (to attach to the air frame), a knife and some spare hands. 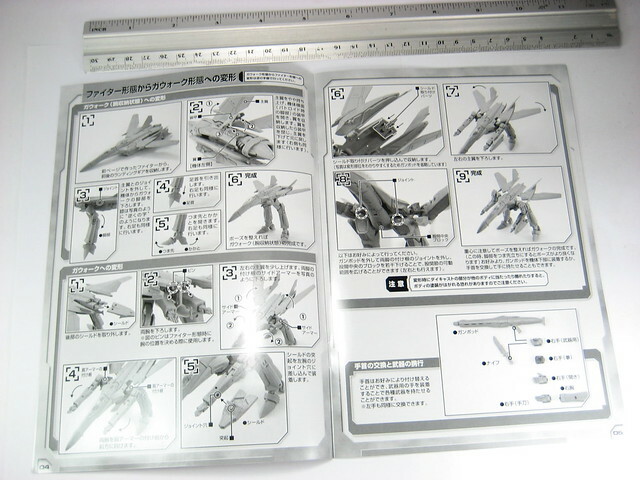 It also comes with a manual to help you transform the kit. 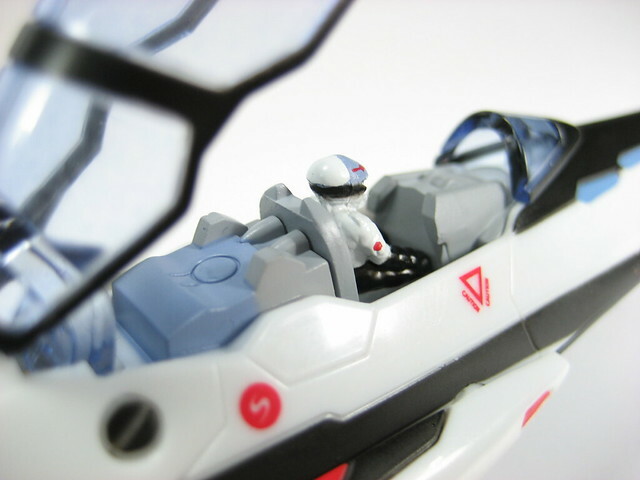 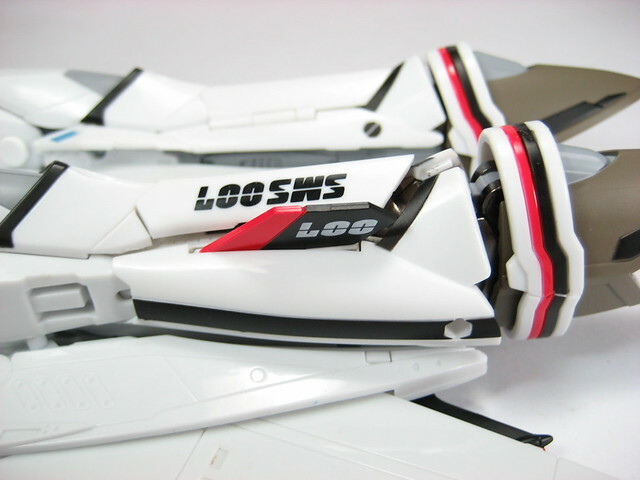 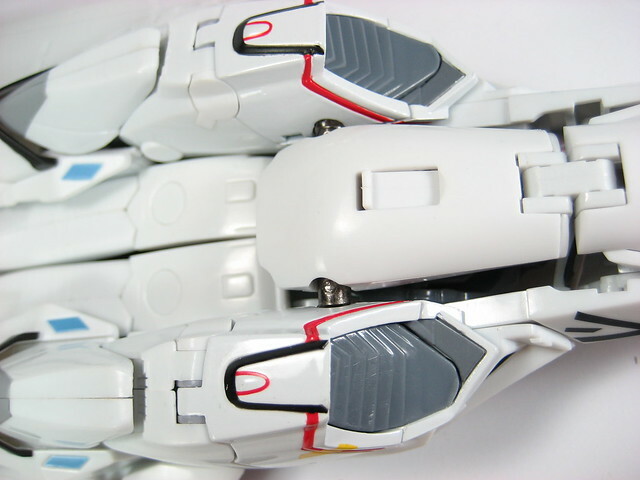 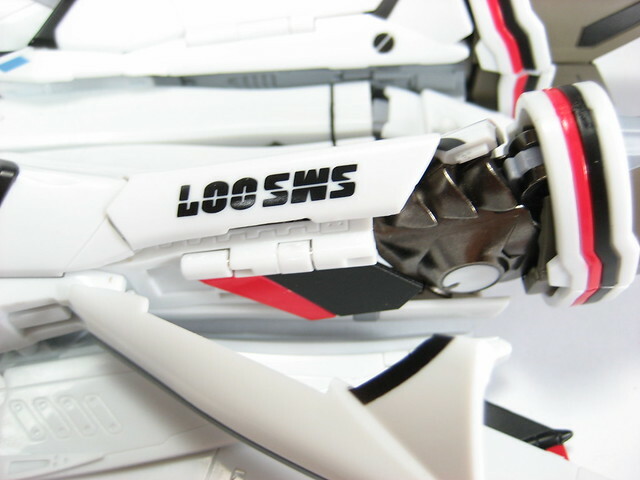 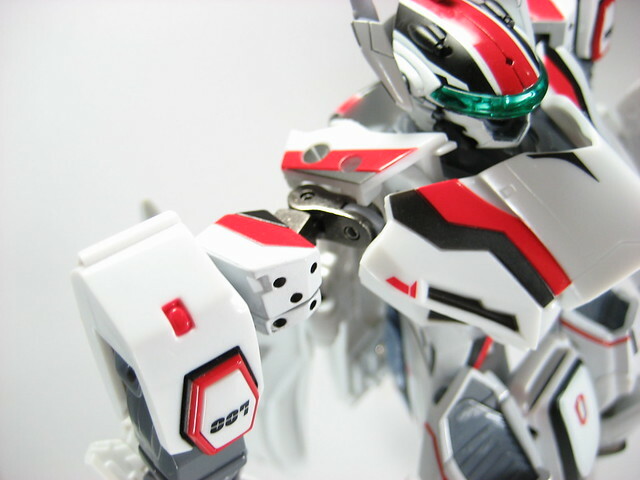 This toy doesn't come with any decals or stickers so what you see is what you get when it comes to the toys details. 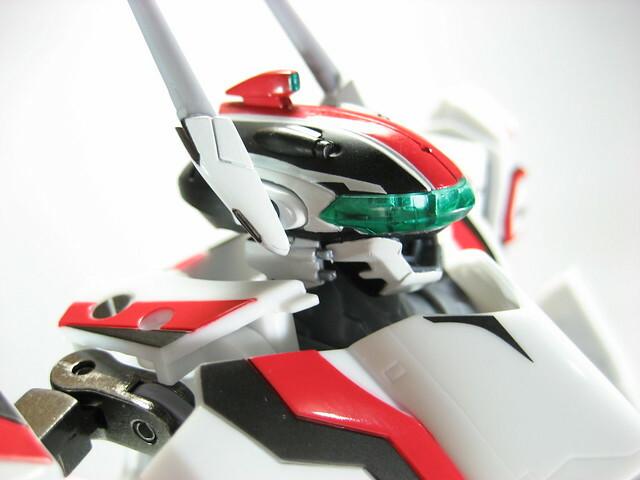 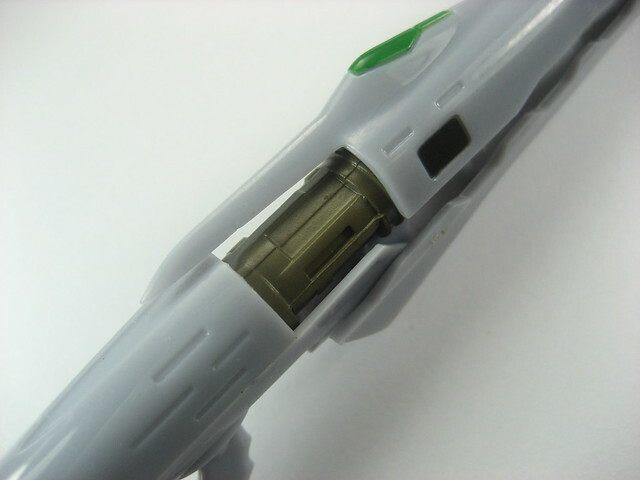 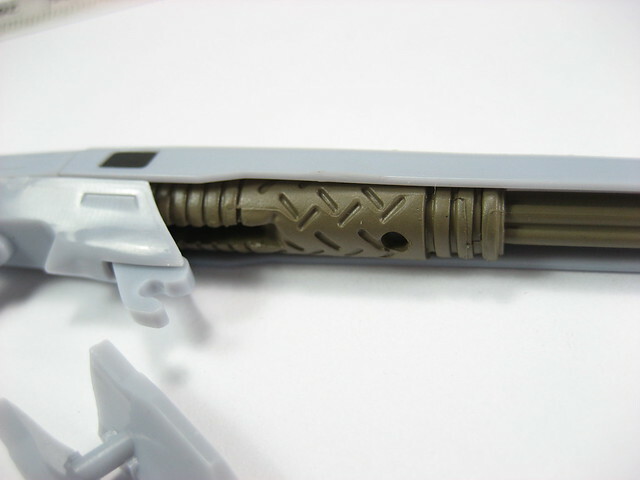 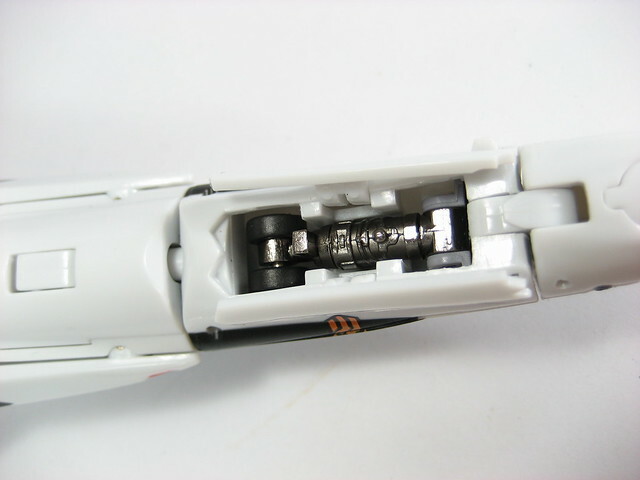 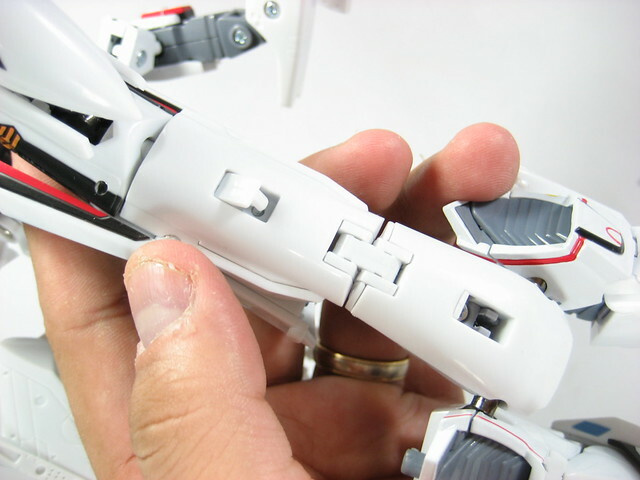 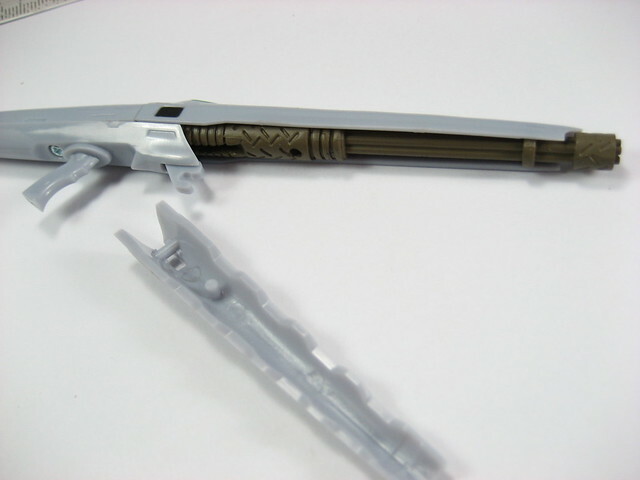 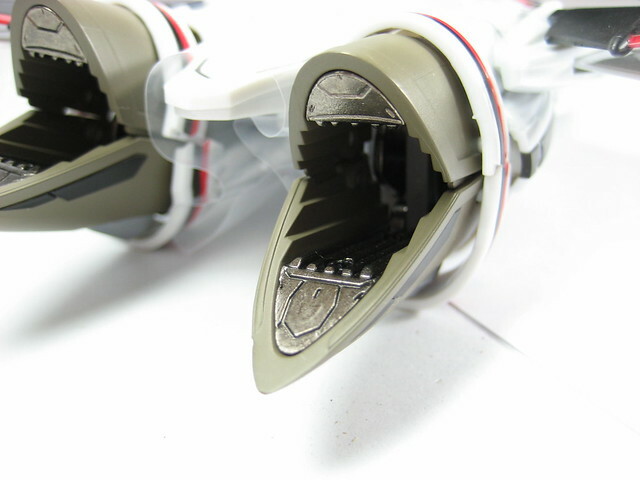 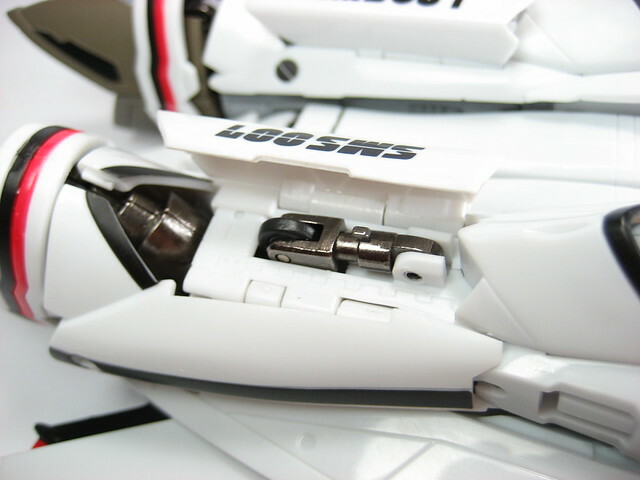 Being a DX Chogokin its bound to have metal parts in it as that is what makes a DX Chogokin a "DX Chogokin". 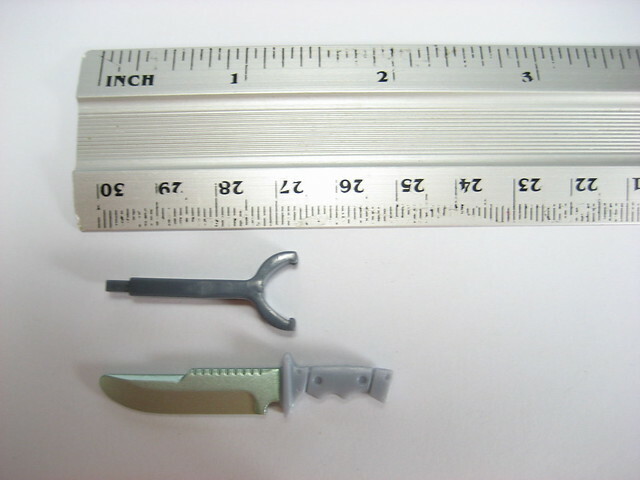 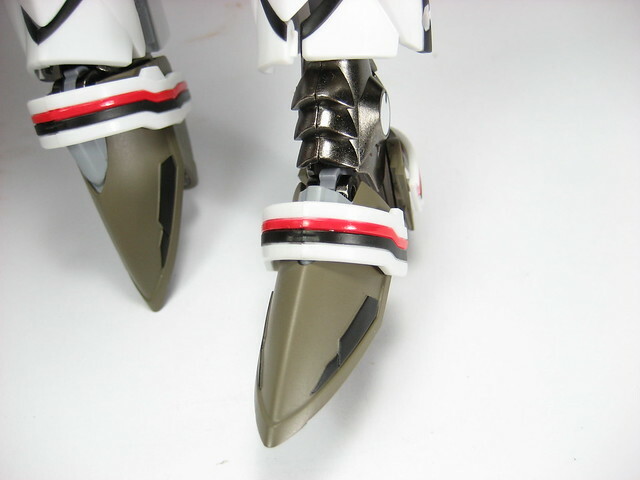 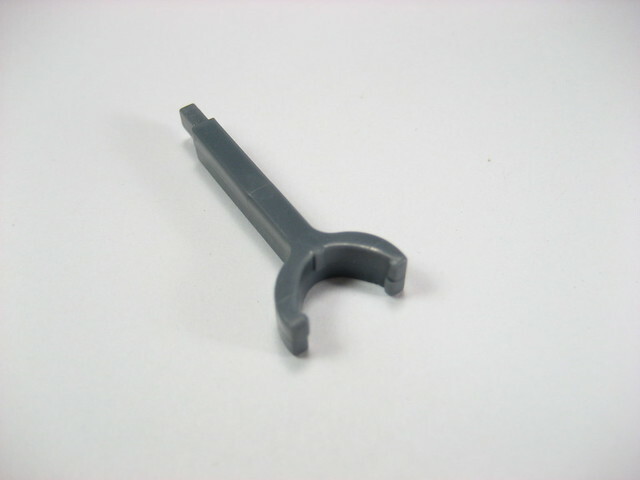 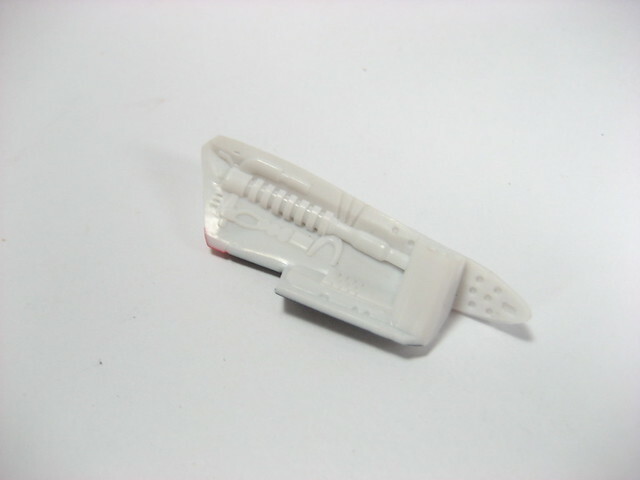 The metal parts in this toy can be found in the ankles, shoulders and hip joints. 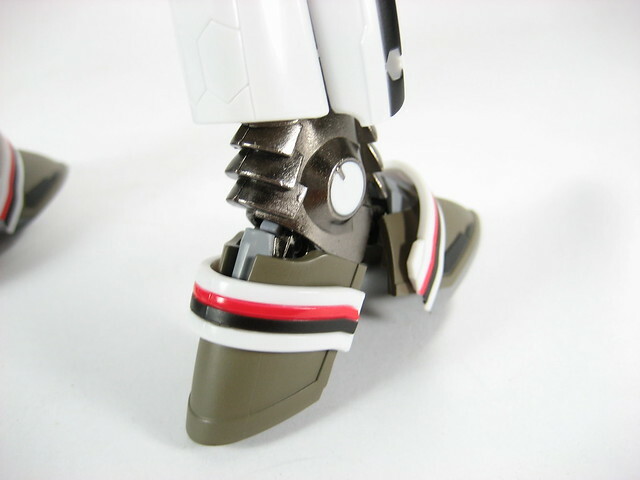 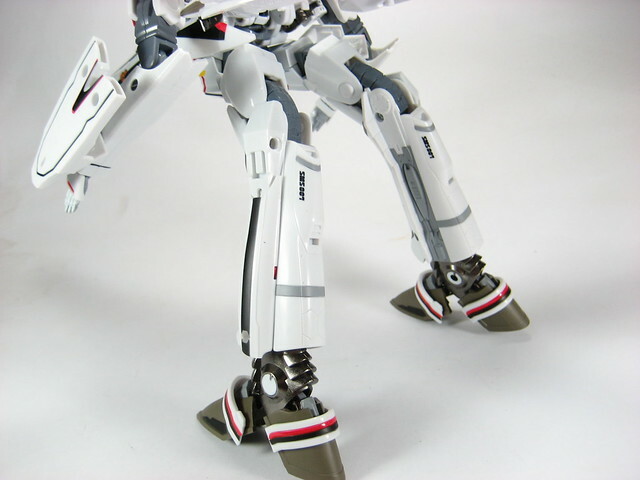 What I like about this toy is the heavy ankle and feet metal parts that make the toy easy to balance in Gerwalk and Battroid mode. 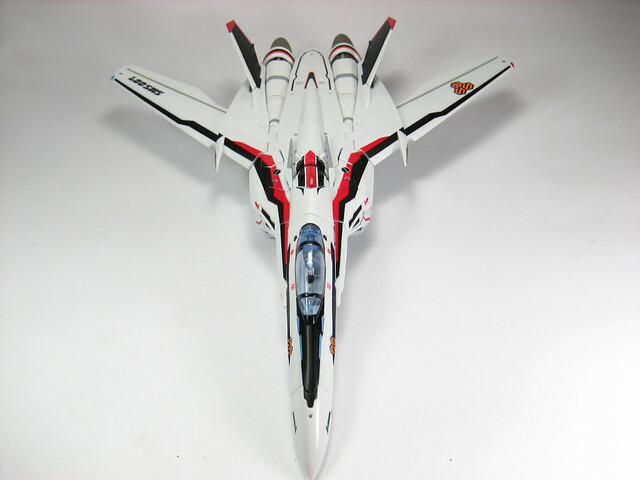 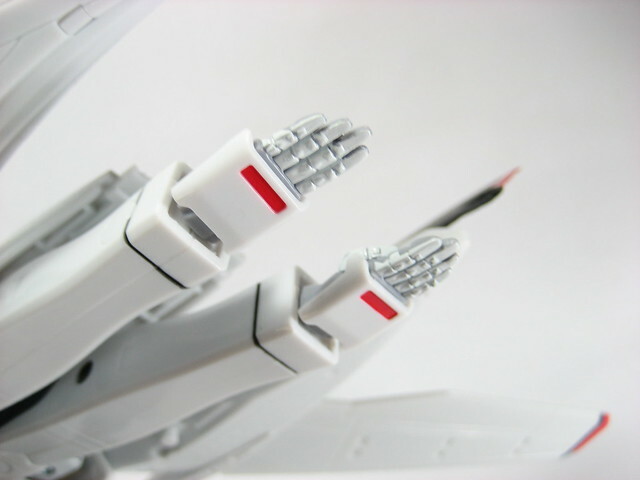 Comparisson Shot of the VF-25F against the 1/60 YF-19 from Yamato Toys. 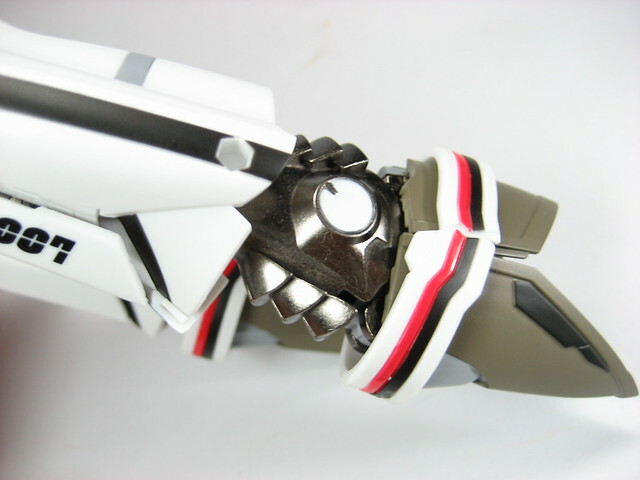 Rear of the head, you can see the edges where the paint chipped off. 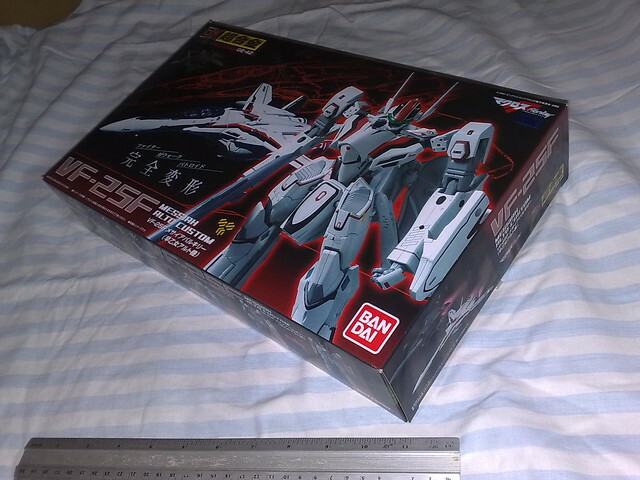 Not my fault though, probably during the assembly process. 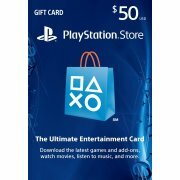 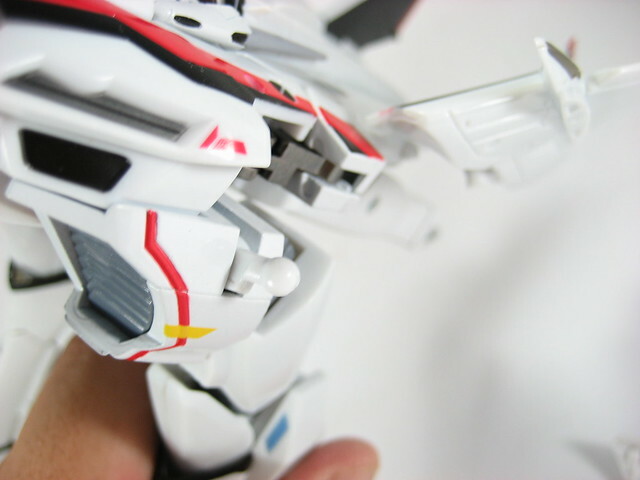 For a more in-depth review, continue to the next pages. 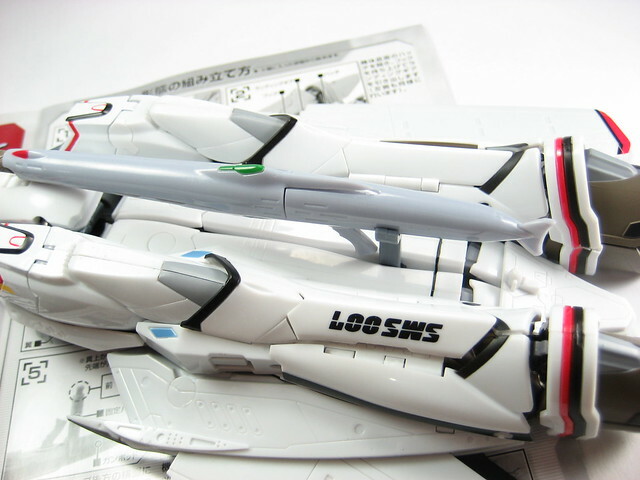 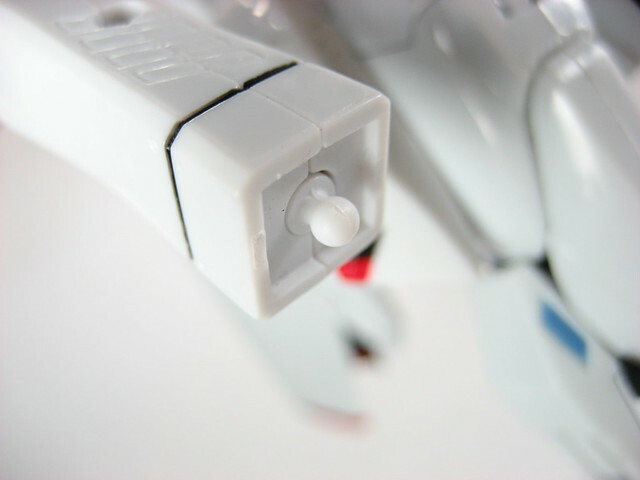 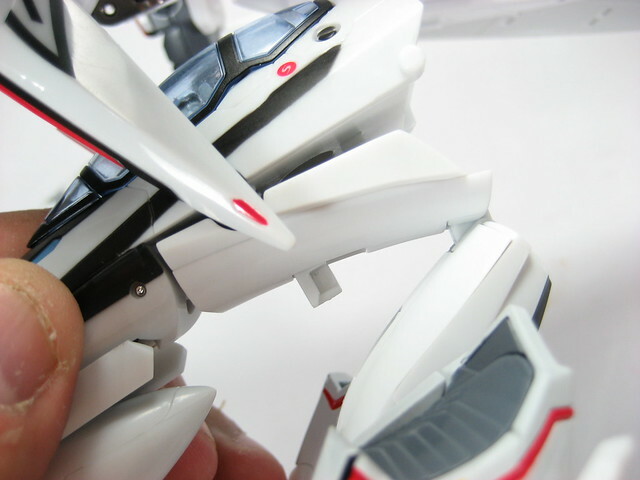 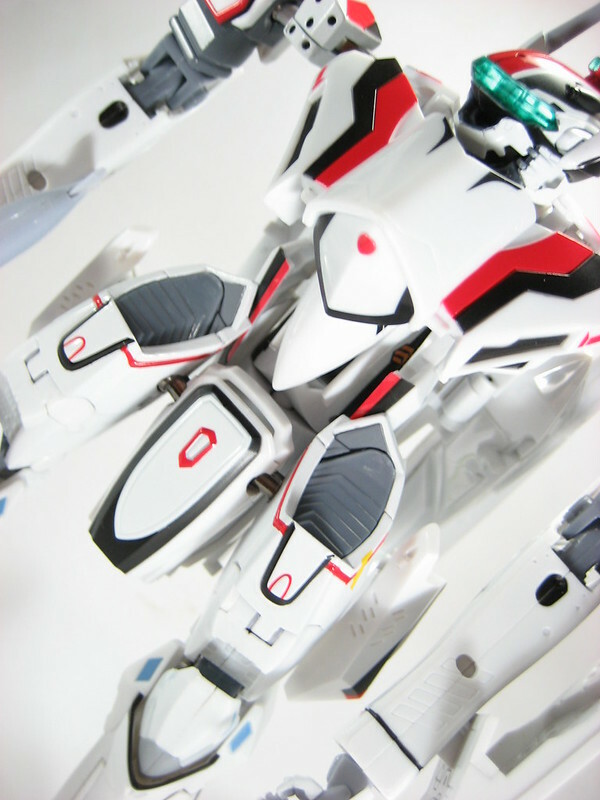 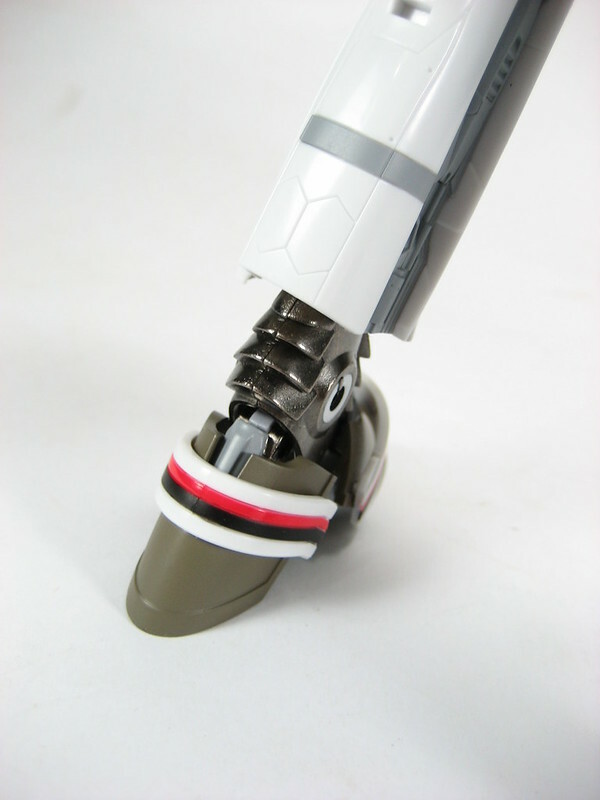 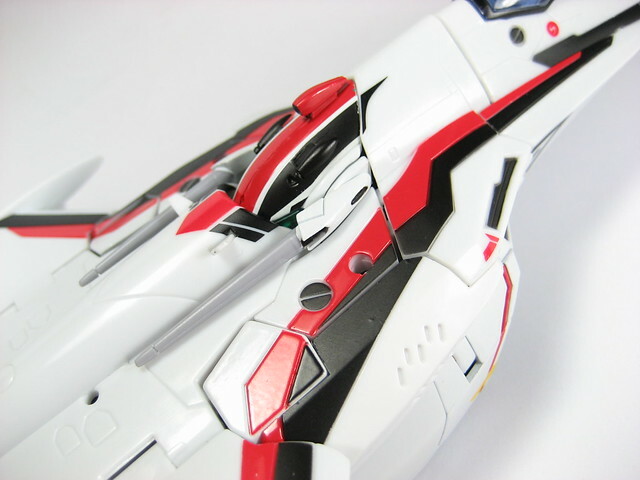 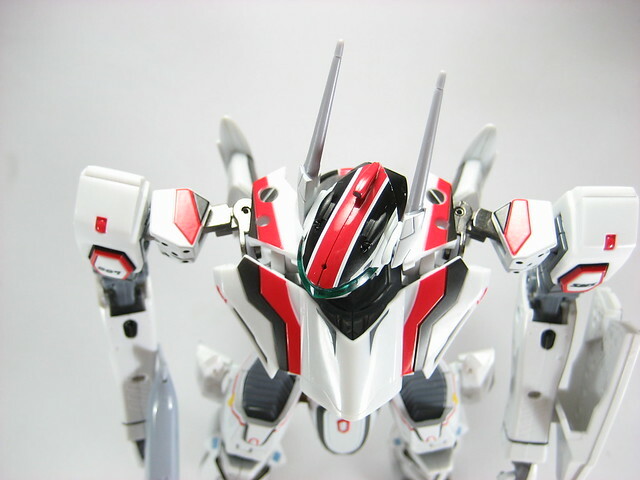 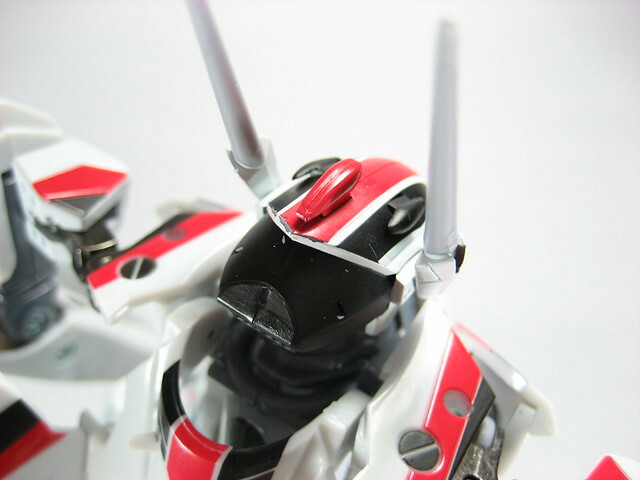 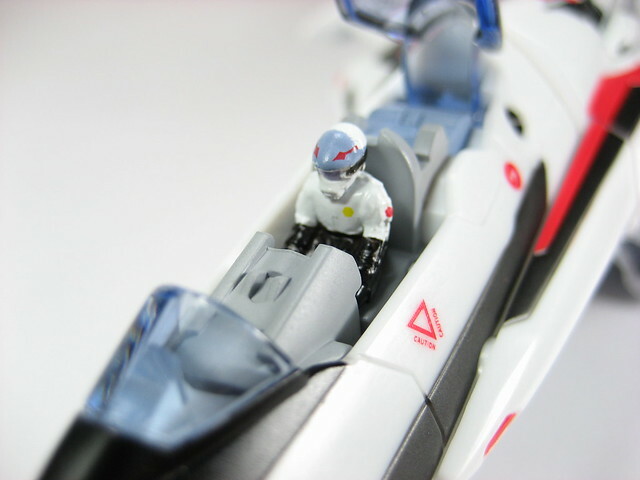 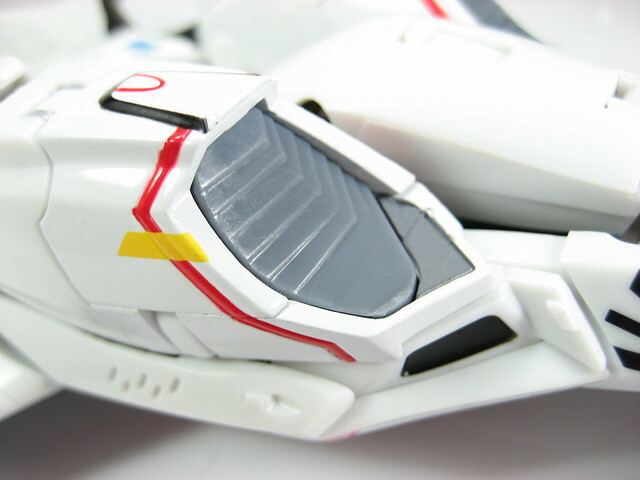 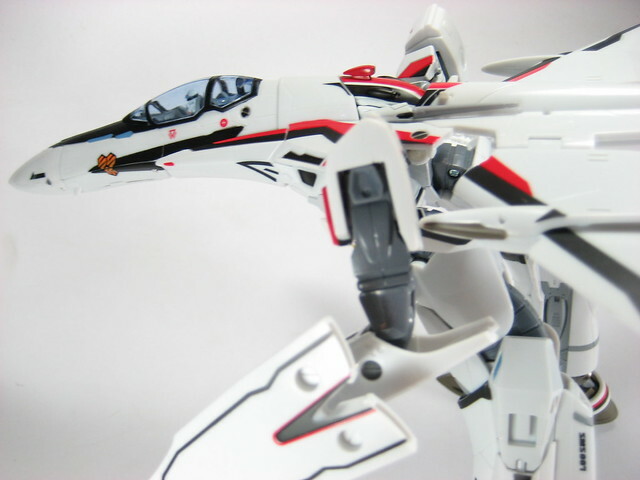 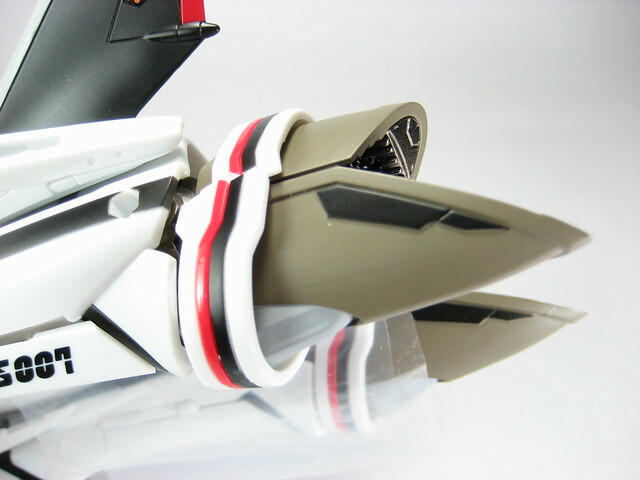 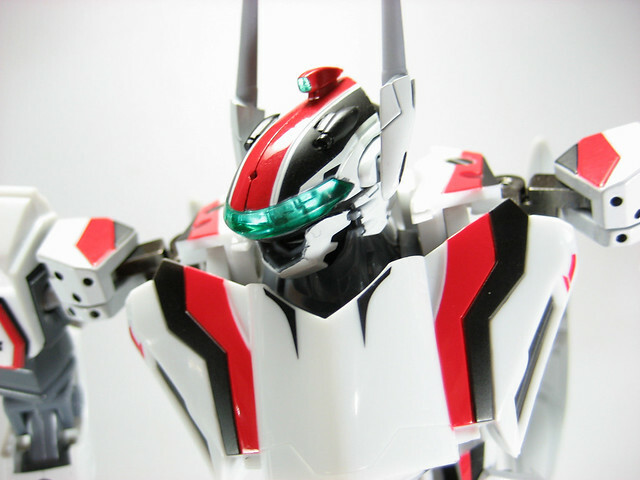 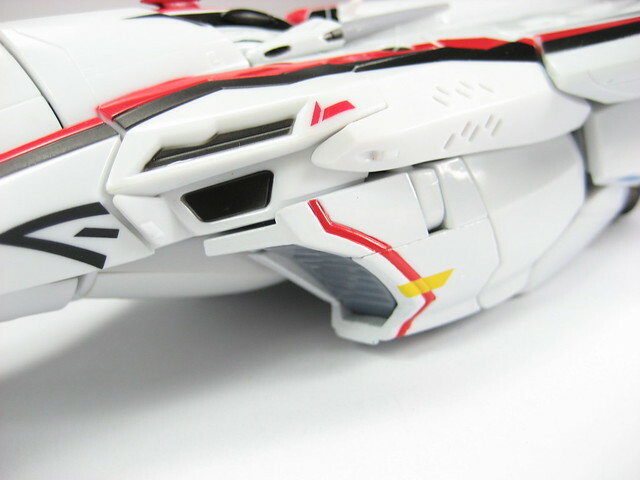 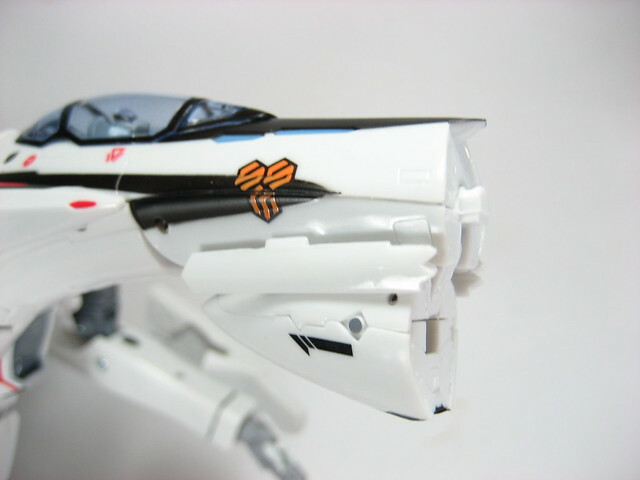 This is one feature where Bandai definitely trumps Yamato Toys. 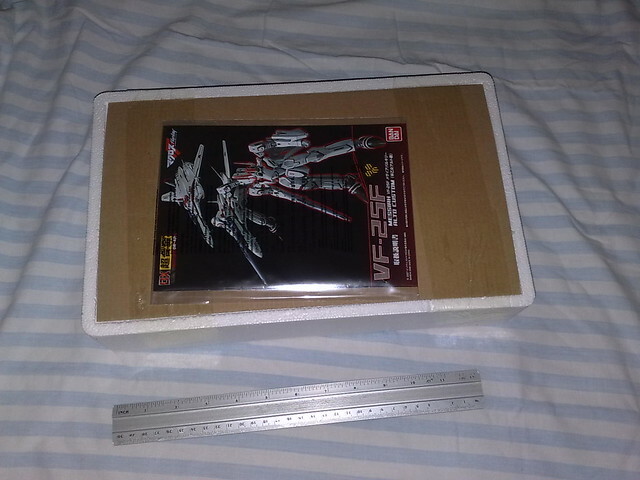 For me, I like small boxes. 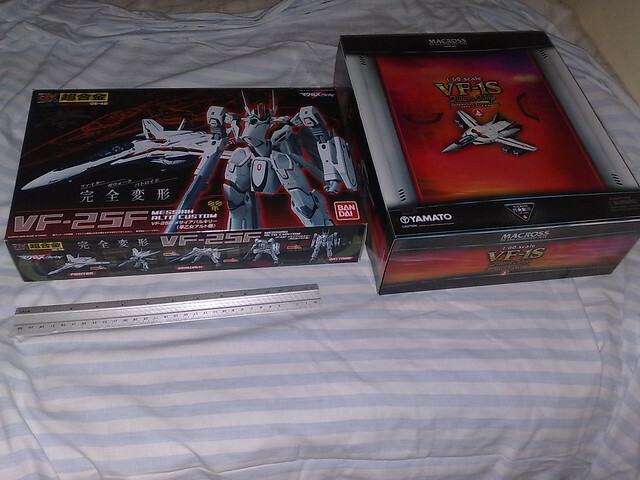 Its because they take up less storage space and because I'm the type of guy who doesn't like throwing boxes away. 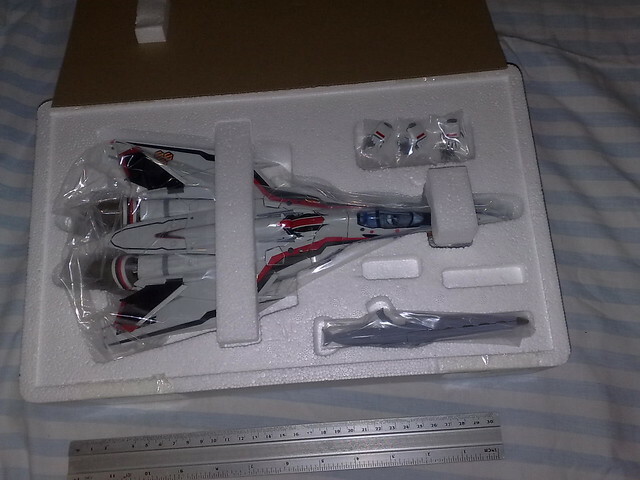 The toy is nestled in a styrofoam box with corrugated box material as a cover. 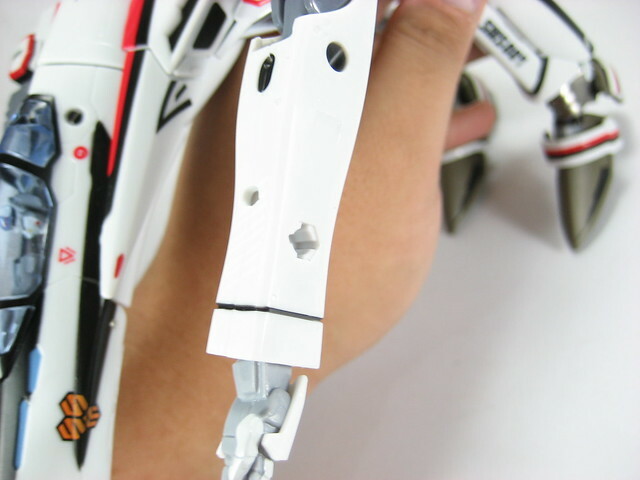 Taped over that is the instruction manual. 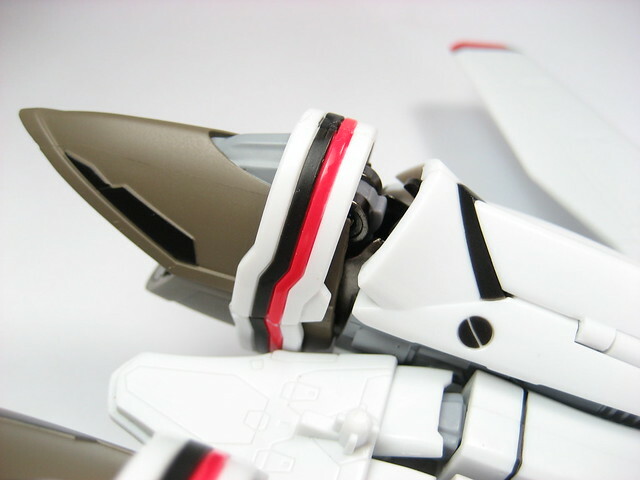 Holding the cover in place is tape. 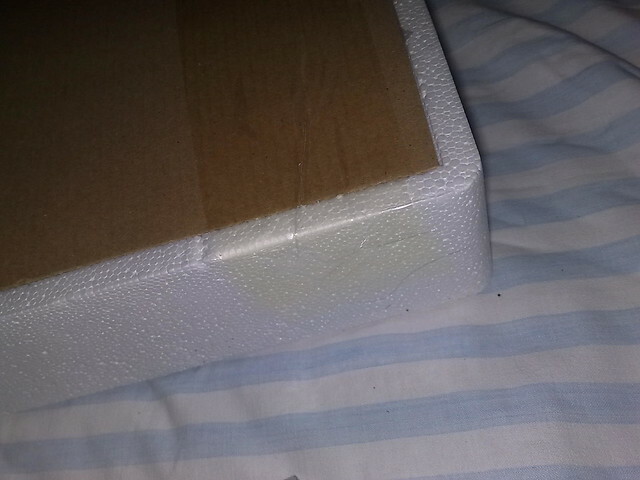 I used a knife to cleanly cut it so as not to damage the styrofoam case. 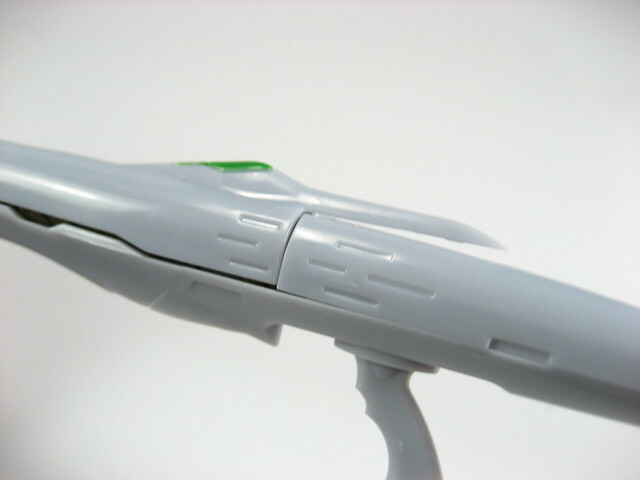 It doesn't stop stuff from spilling out however as the following shot will illustrate. 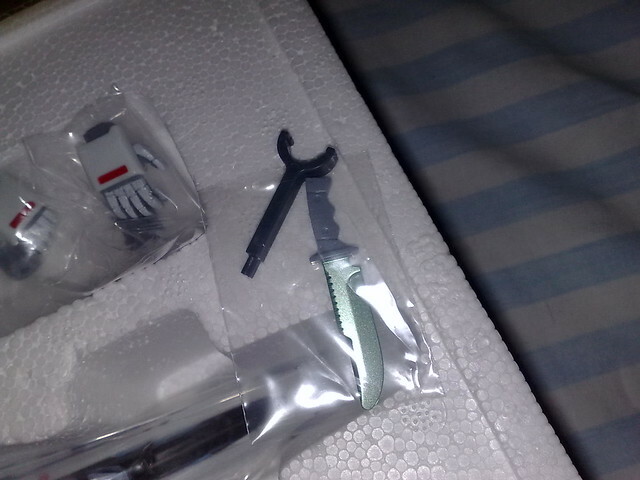 Luckily no harm done as the parts were still found within the box. 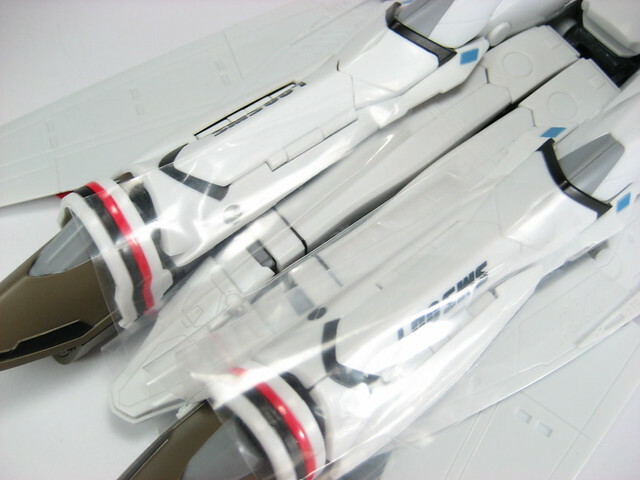 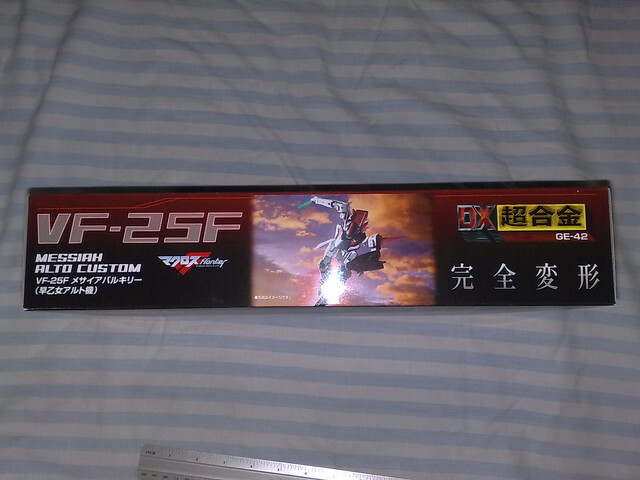 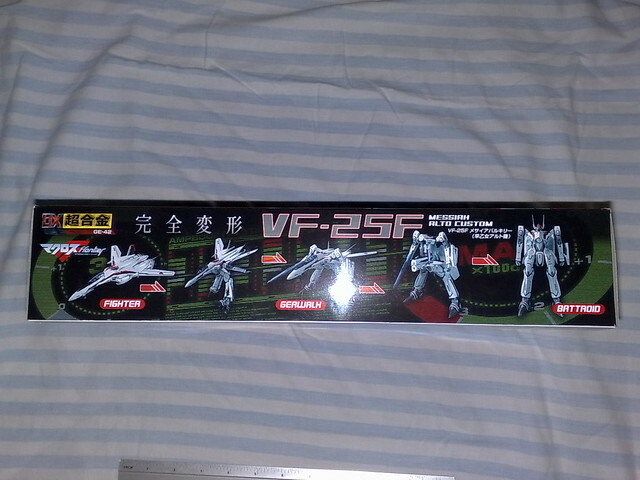 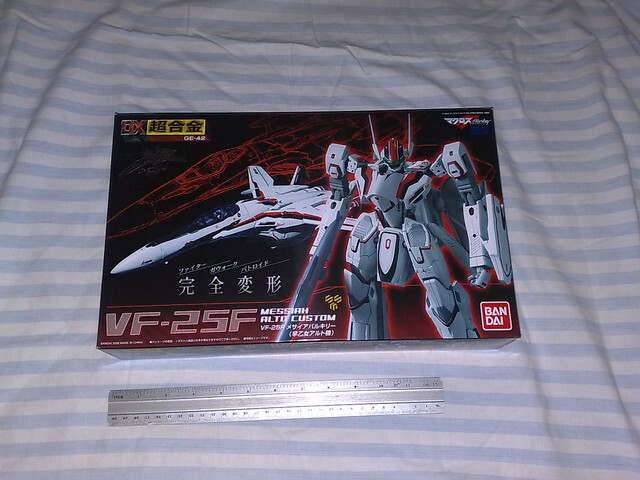 VF-25F is inside a plastic bag along with the other stuff. 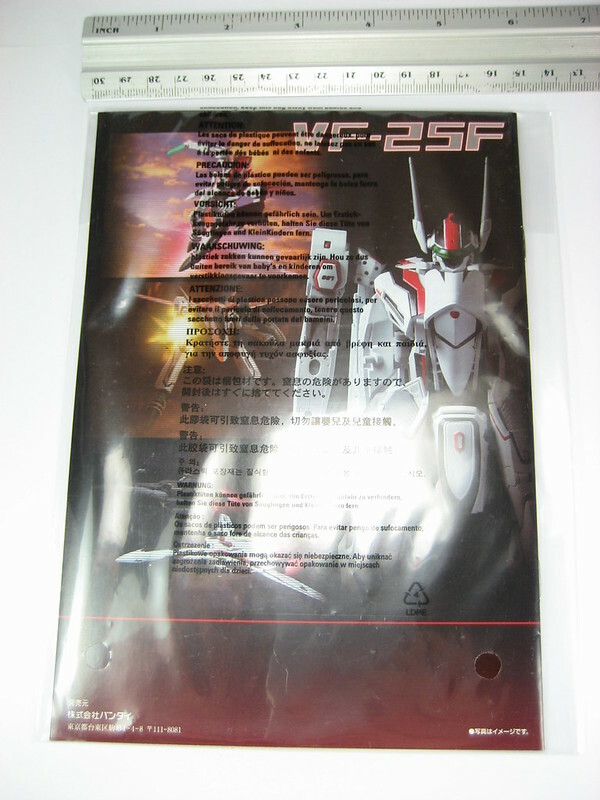 As for the writing on the plastic bag of the VF-25F and the manual. 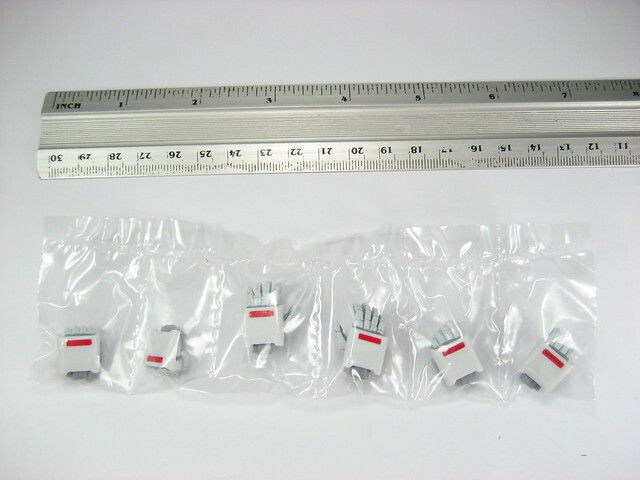 All it says there is that the plastic bag should be kept out of reach from children to prevent them from accidentally being choked. 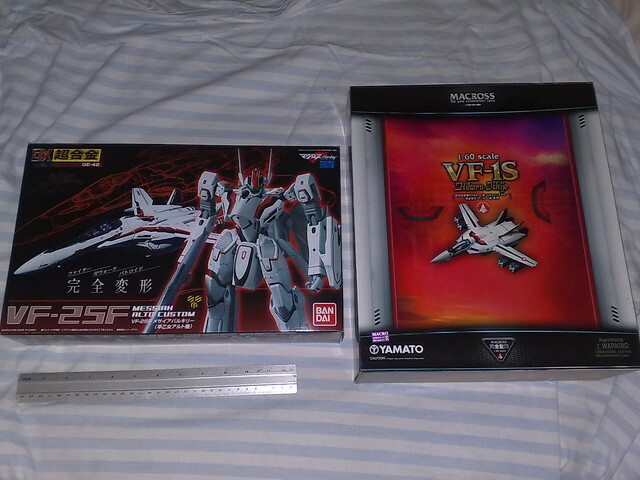 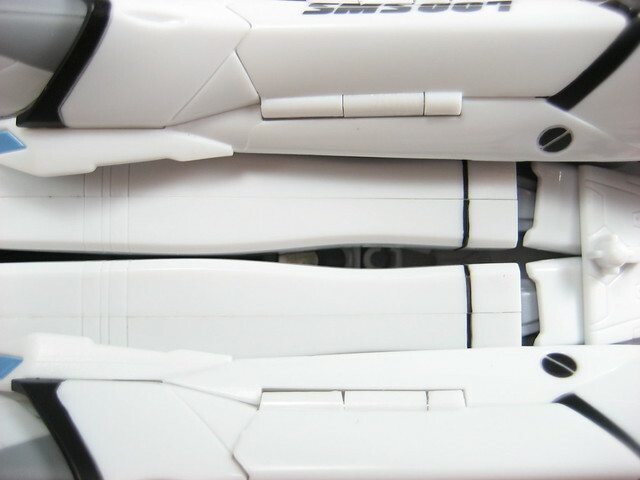 Comparisson shot of the box of the VF-25F with the 1/60 VF-1S of Yamato Toys. 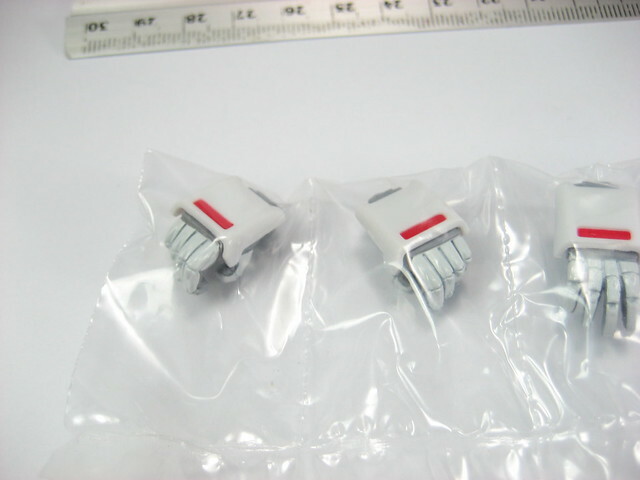 3 sets of spare hands available. 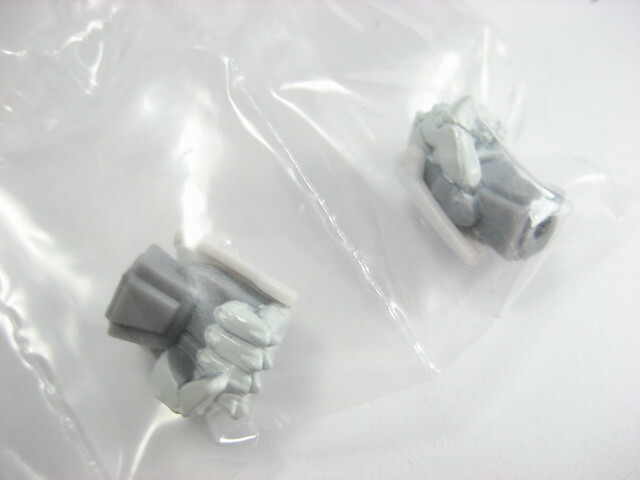 They come in a sealed plastic container and aren't resealable. 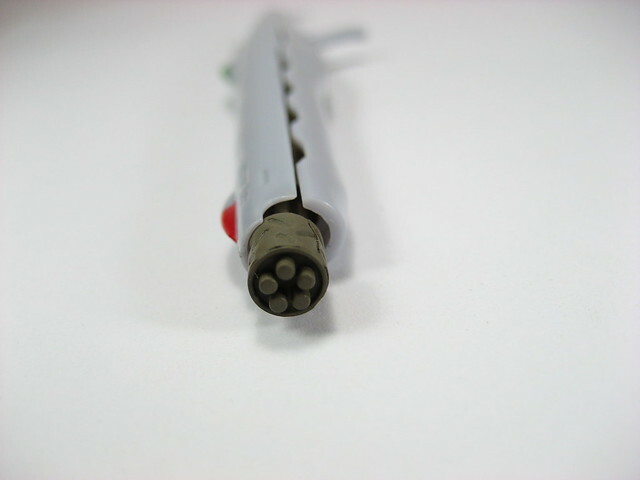 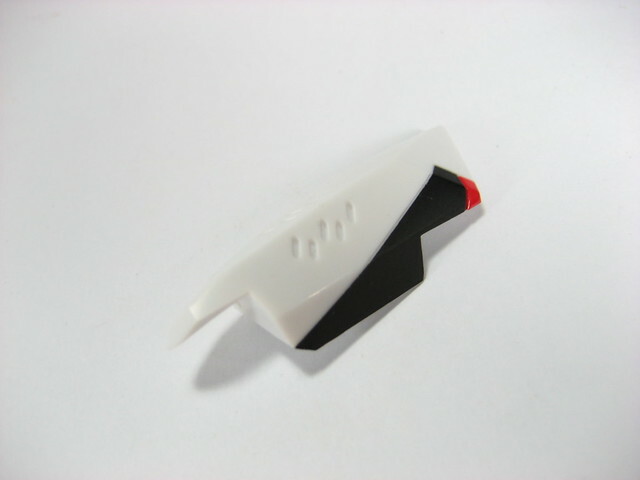 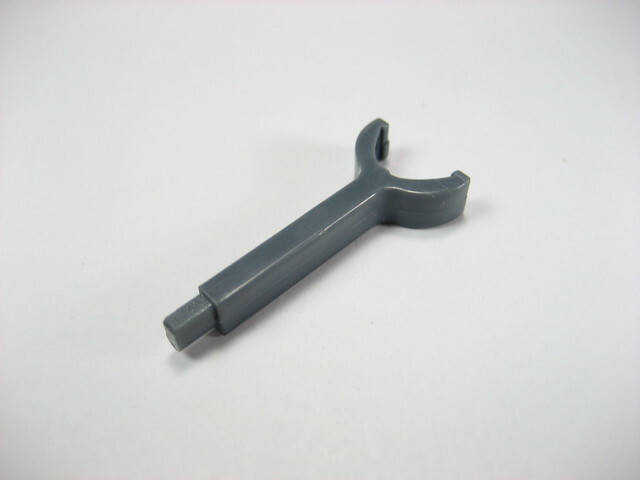 Shooting hand, these are molded and cannot be opened or closed. 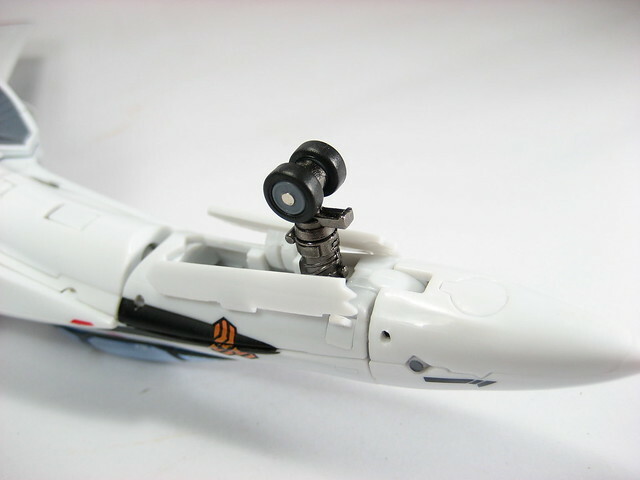 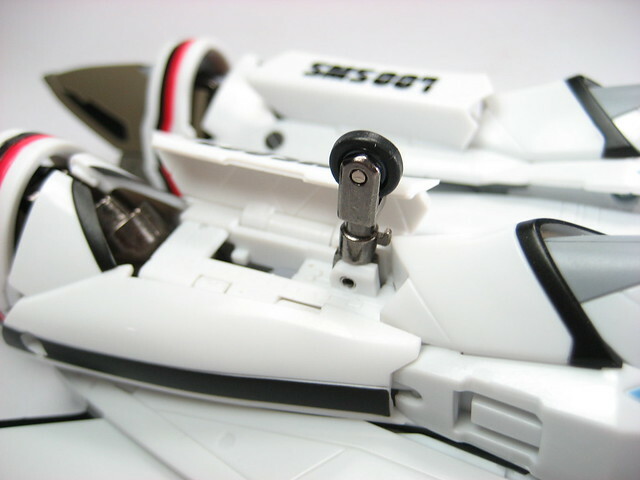 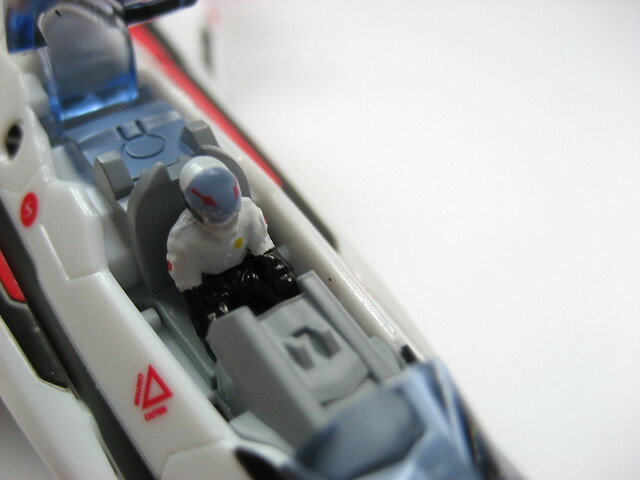 Alto Saotome in the opened cockpit, note the lack of detail in the cockpit dials.